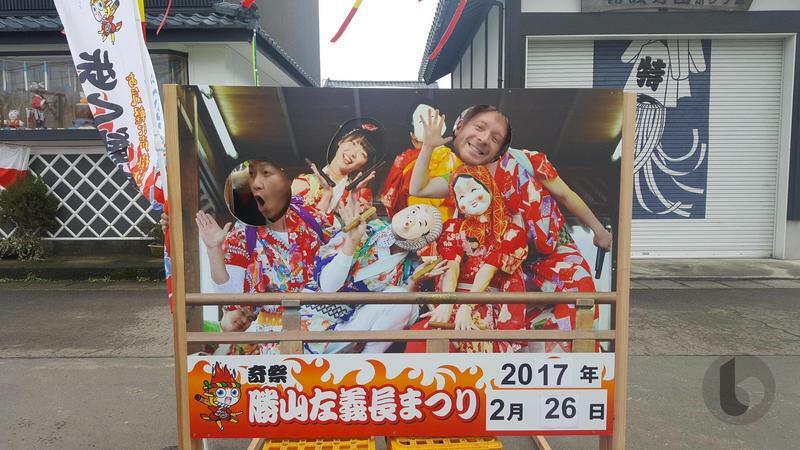 My wife went on an extended vacation with her mother a few months back, and I was left to my own devices for a whole two weeks. 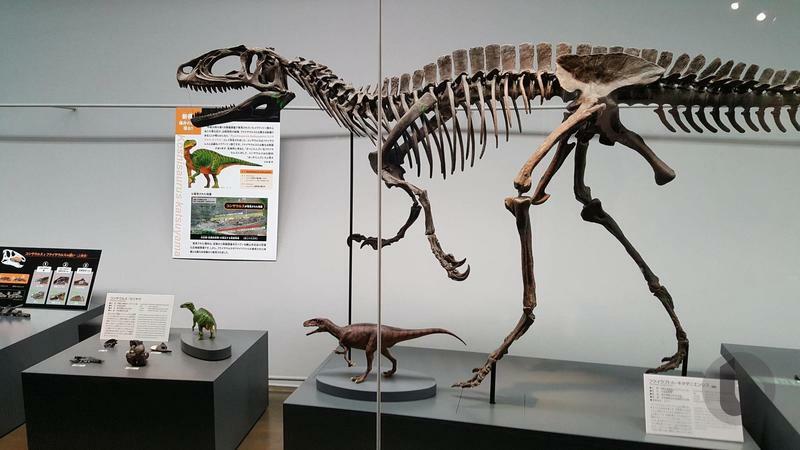 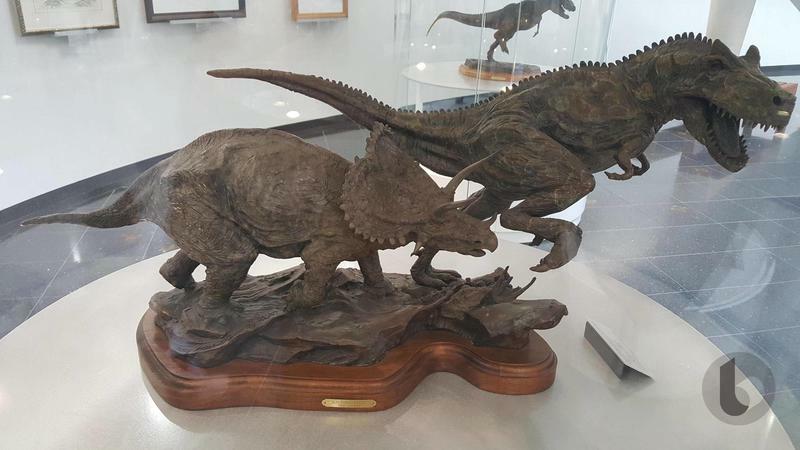 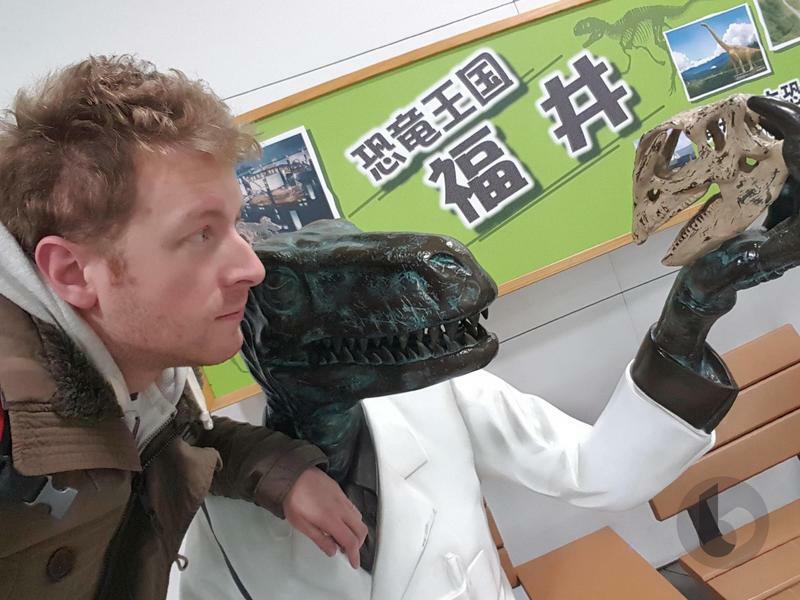 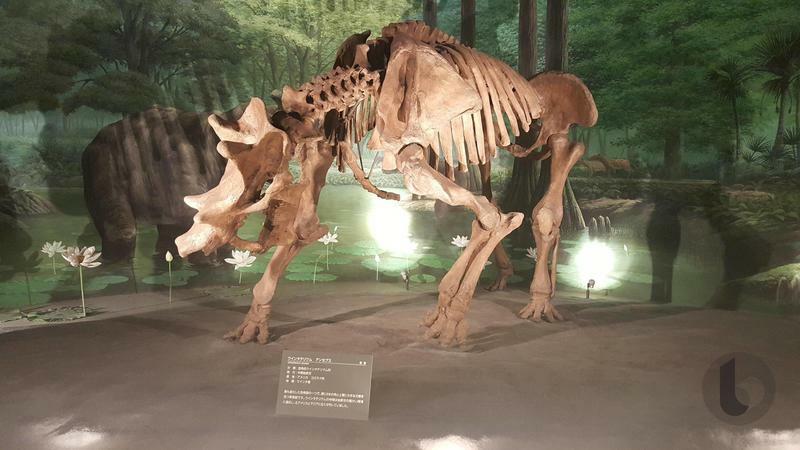 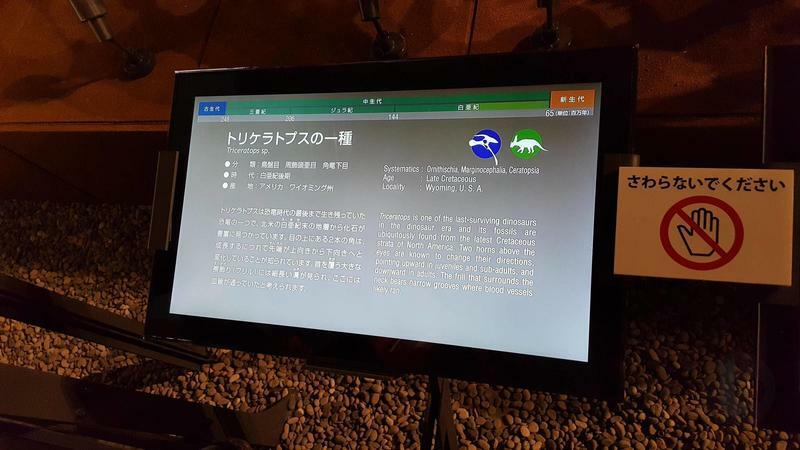 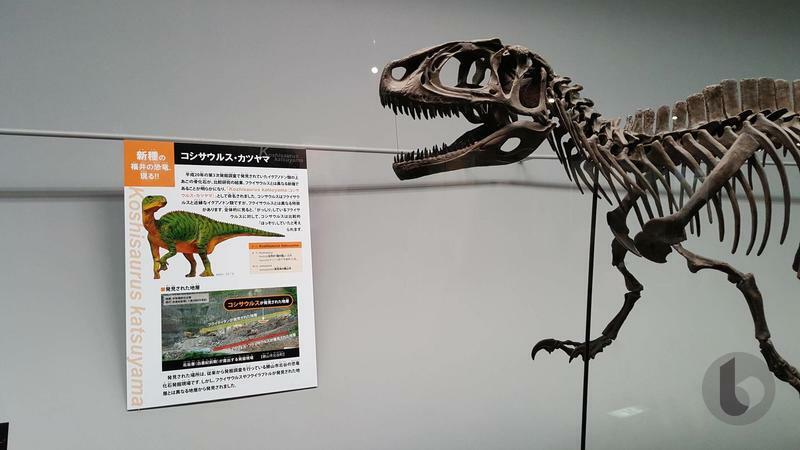 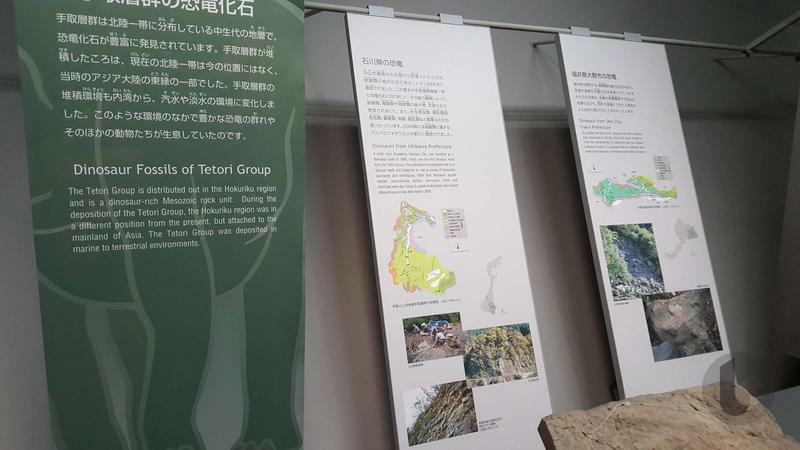 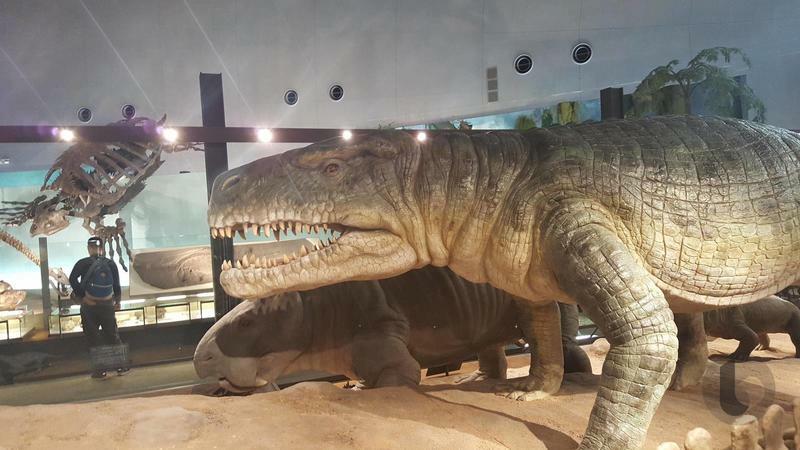 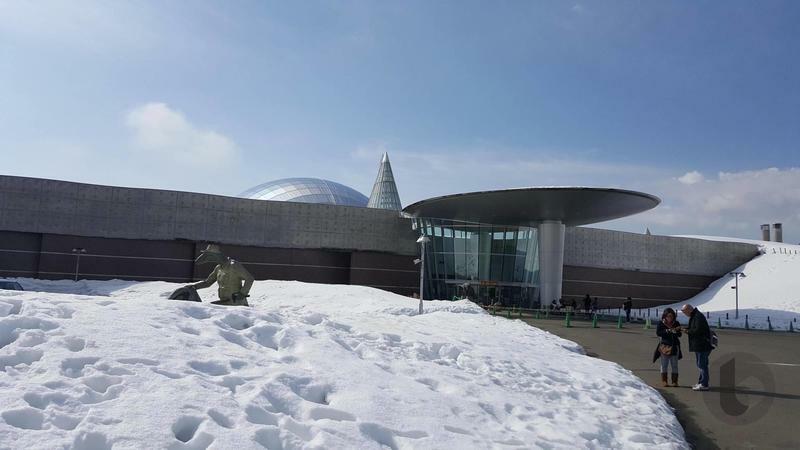 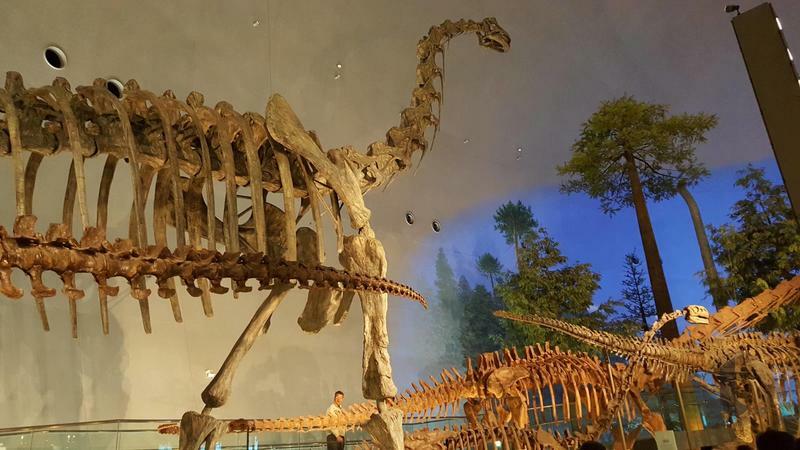 I ultimately decided not to spend those two weeks exclusively with my electronic devices, and instead, I hit the road to one of my long-time wishlist destinations, the Fukui Prefectural Dinosaur Museum. 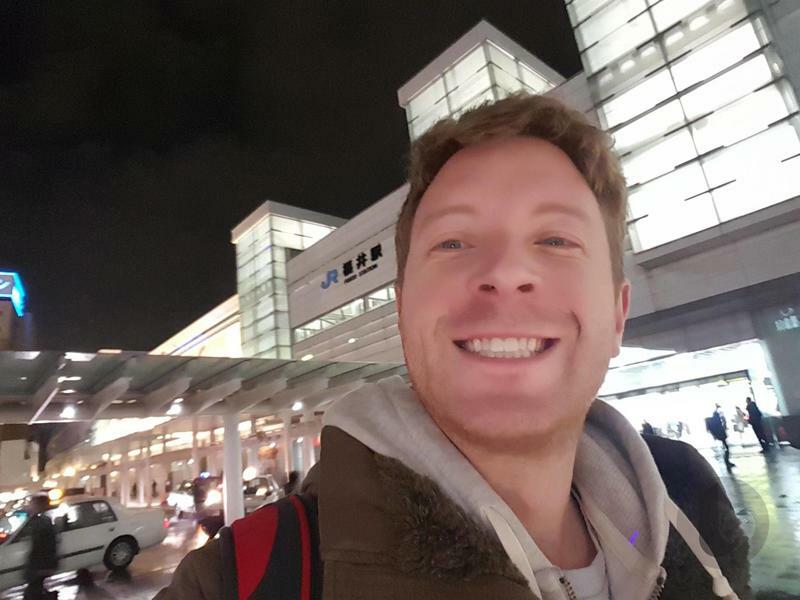 Naturally, since it had been forever since I truly got to enjoy such an extended amount of “me time,” I took the opportunity to do some “hitori ryokou,” or “one person traveling” if we’re speaking English. 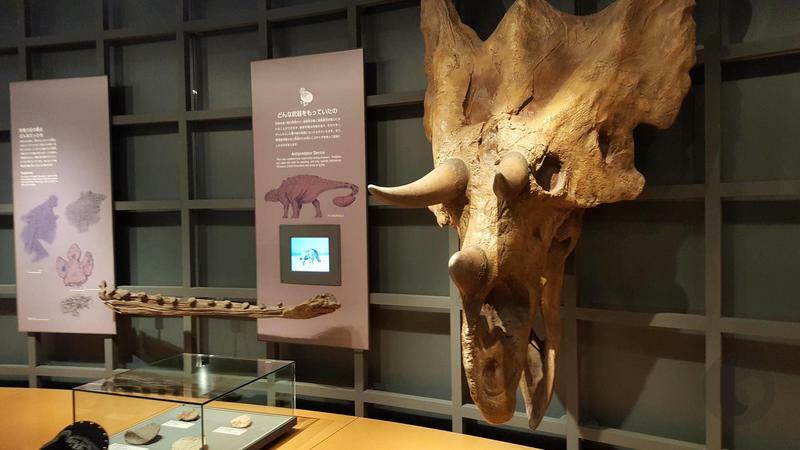 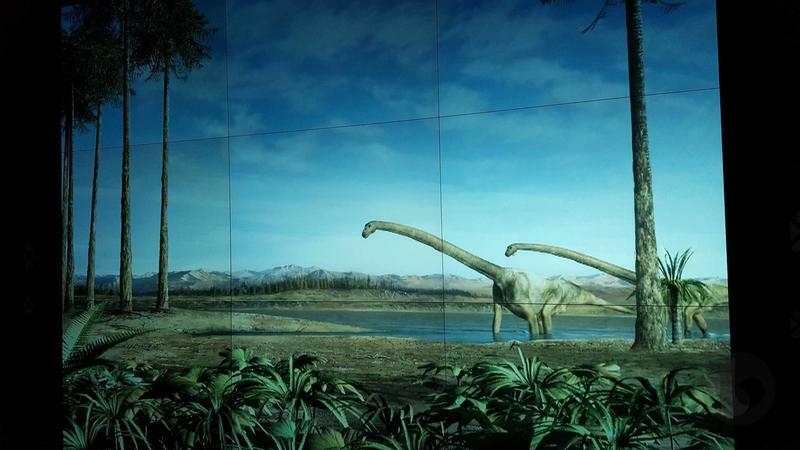 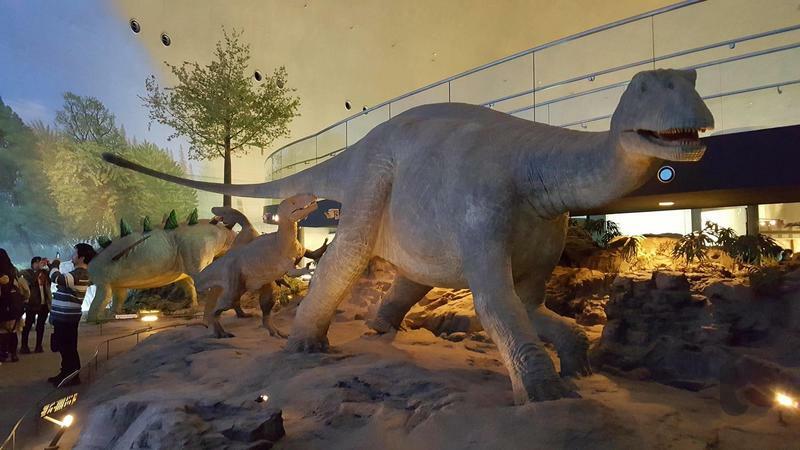 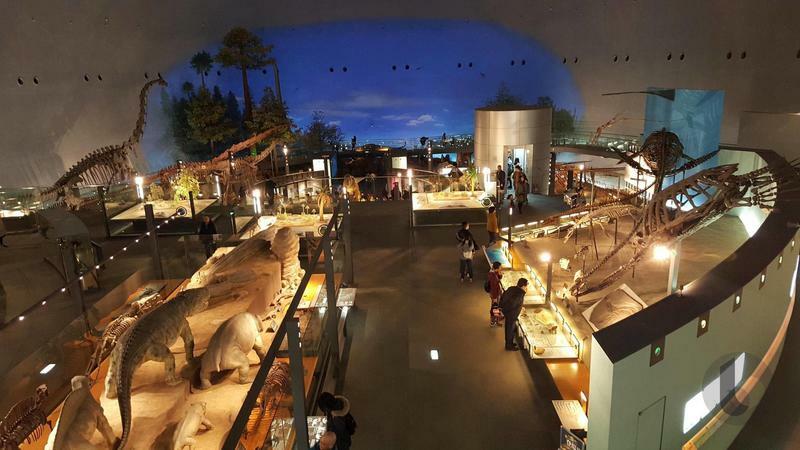 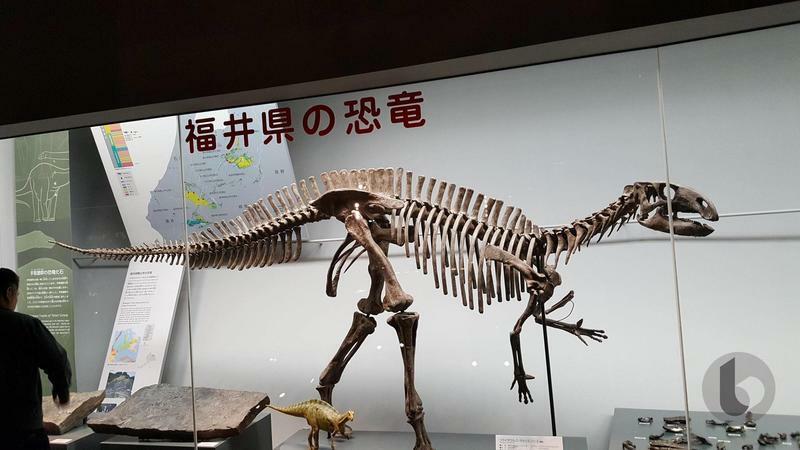 The Fukui Prefectural Dinosaur Museum is located in Fukui Prefecture, and the main structure opened its doors back in the year 2000. 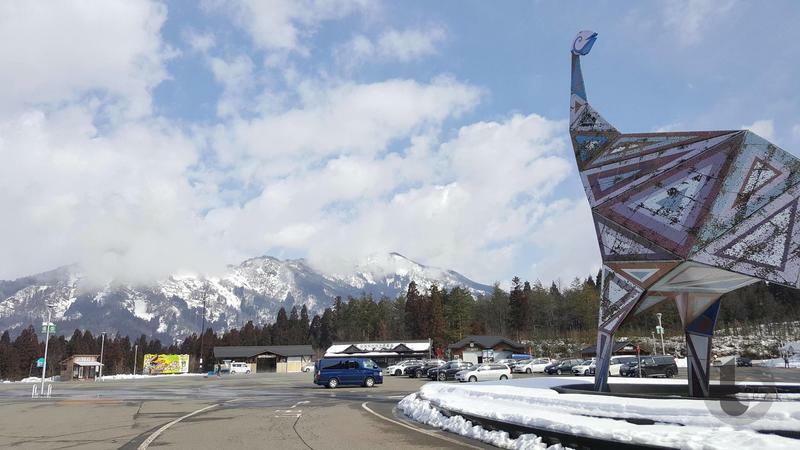 You can get to this impressive location by traveling north for about two and a half hours from Osaka on one of Japan’s Thunderbird rapid trains. 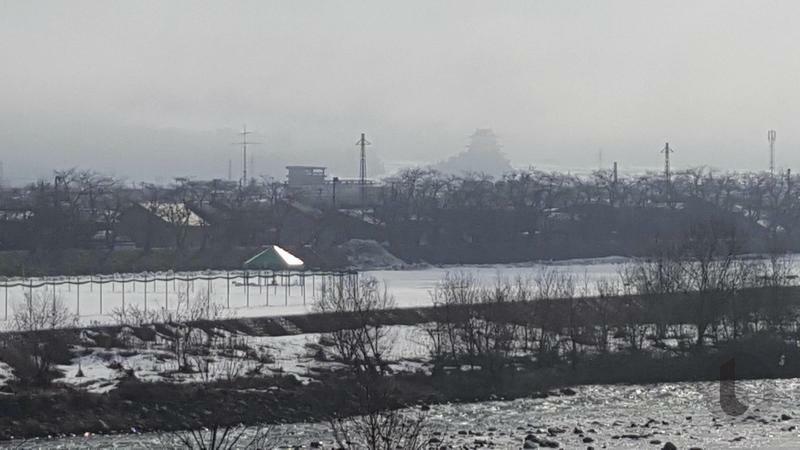 While not far, I decided to make an overnight trip of it and complete the local leg of the journey the following morning. 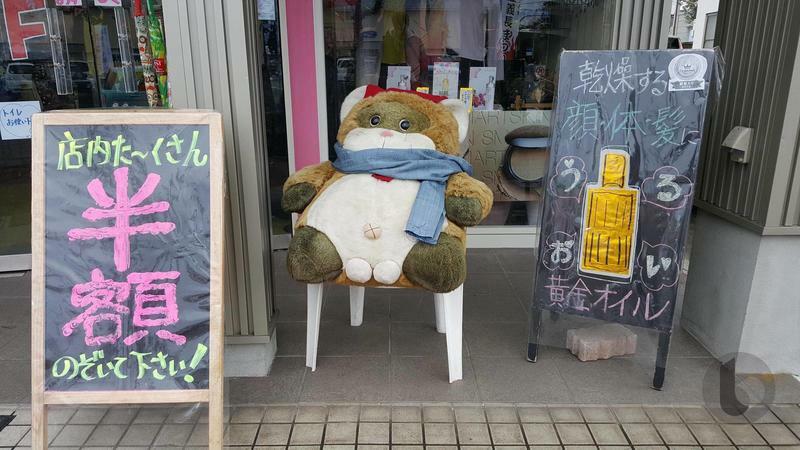 This means overnight in a Japanese “onsen,” or hot spring resort. 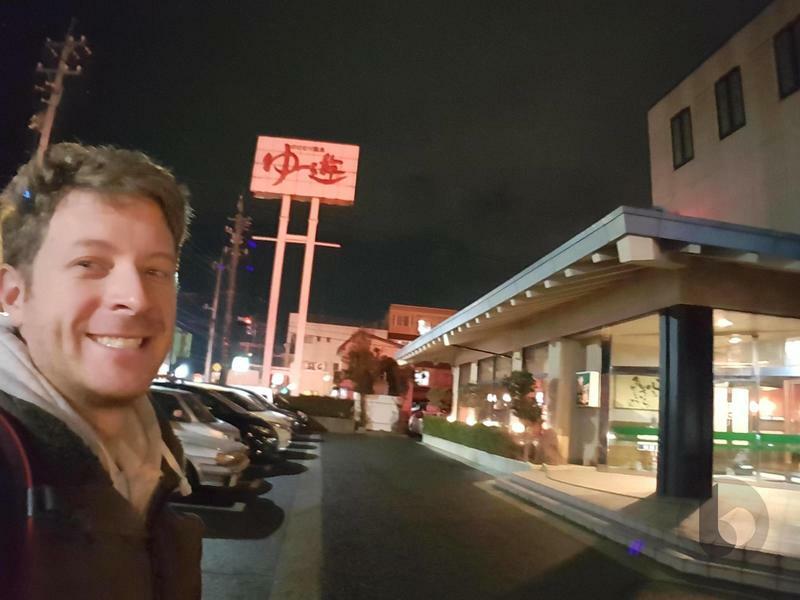 No, I did not have any anime filler episode shenanigans, but I did help myself to a fine Korean barbecue dinner and a healthy dose of Premium Malts, Japan’s best macro-brewery beer. 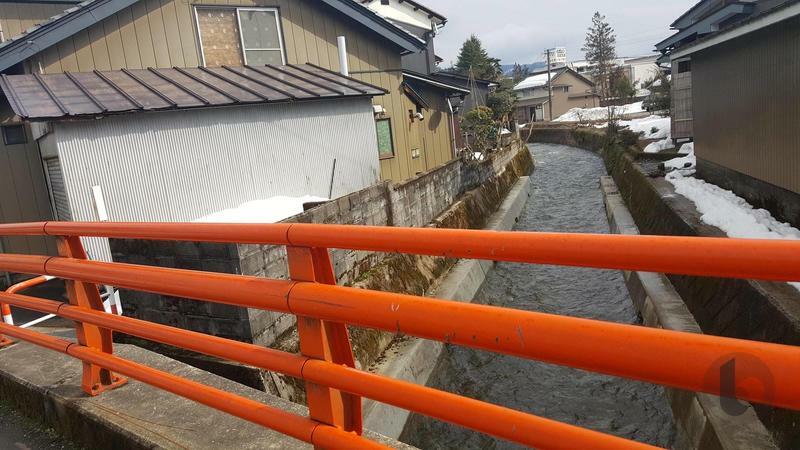 Onsens are always comfortable, and they are easily the most fulfilling way to travel. 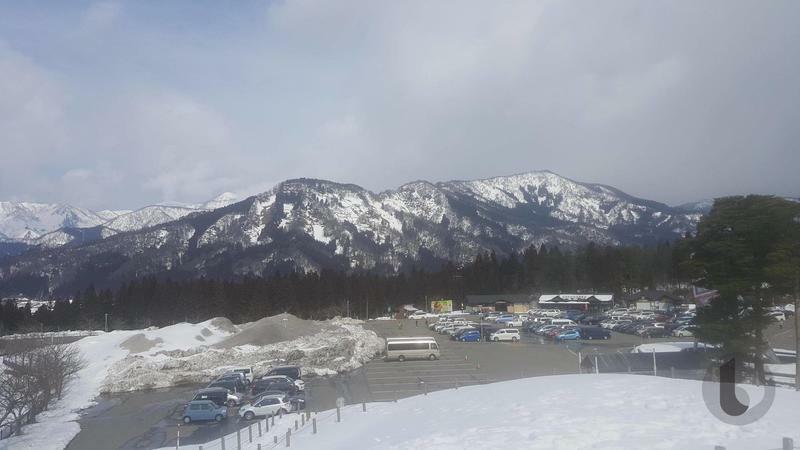 I’d never stay at a five-star hotel if a local onsen had a room available. 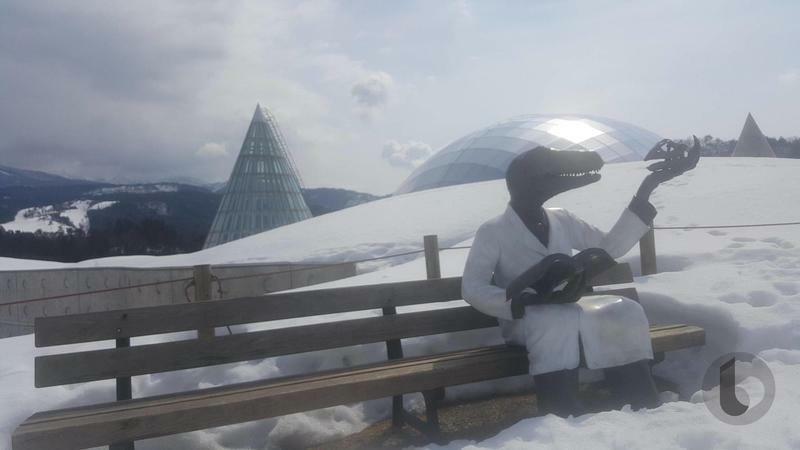 There’s nothing like the hospitality in these places. 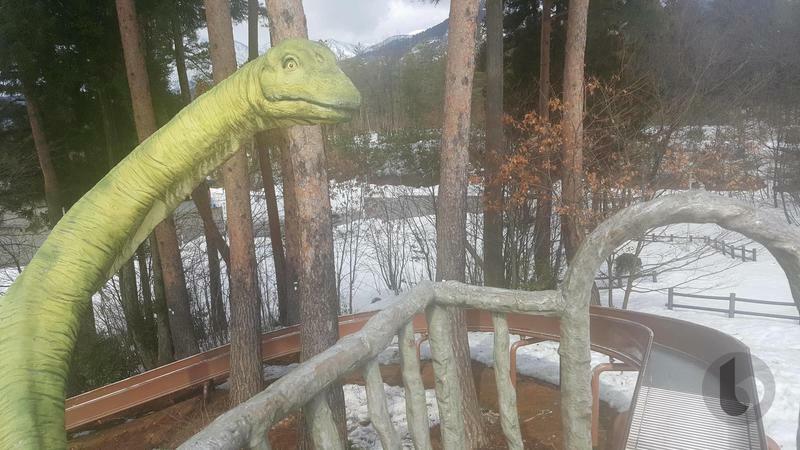 I had no shortage of relaxation in the various tubs this specific resort offered. 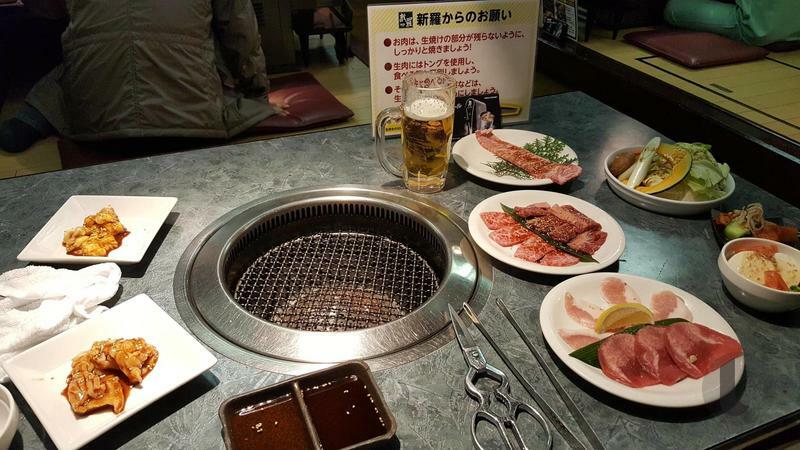 All in all, the first leg of my trip was simple, tasty, and exactly the relaxing getaway I had hoped for. 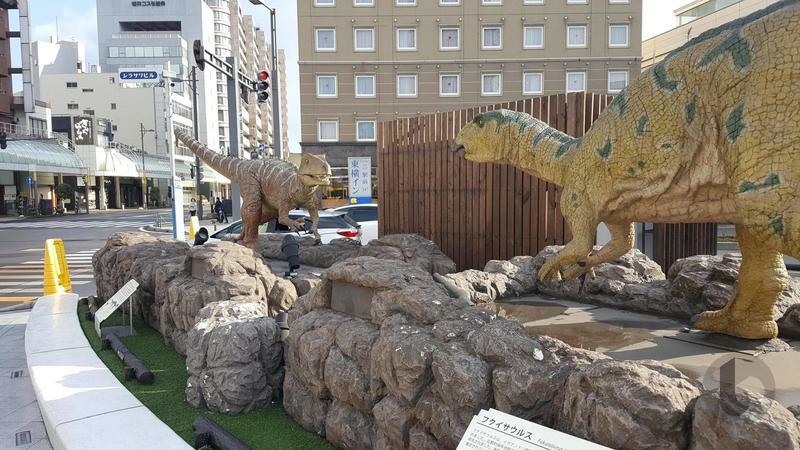 Downtown Fukui City is a quiet place when compared to Kobe or Osaka, and I didn’t venture too far from the station. 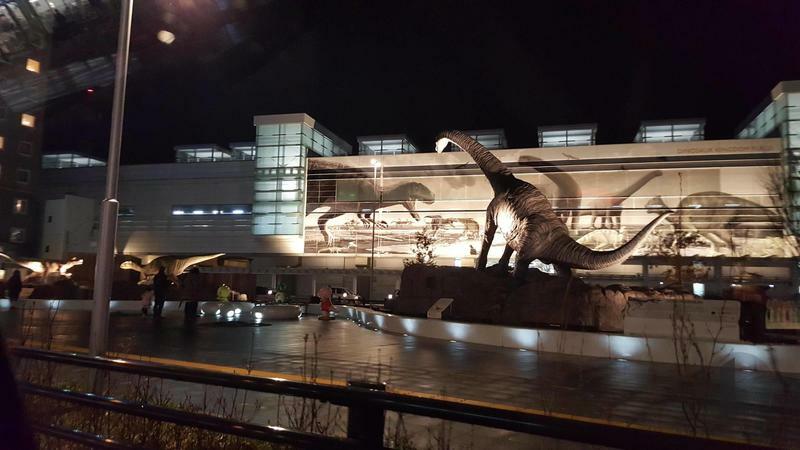 For my short trip, the station itself was enough to see since it’s decked out to look like Jurassic Park. 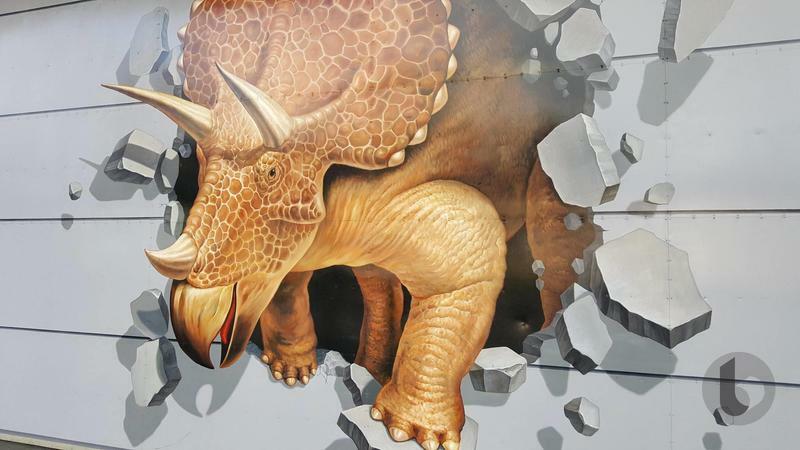 Animatronic dinosaurs dominate the streets, and a giant mural plastered across the wall really takes you back over 65 million years ago. 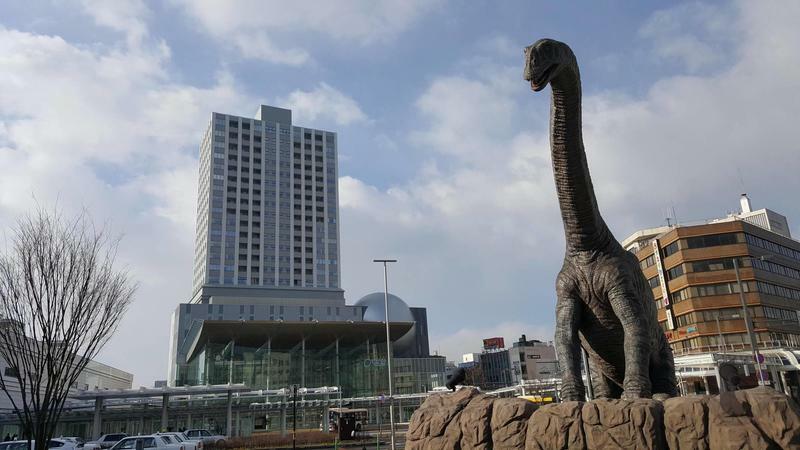 It shows that the city really knows the true tourism pull. 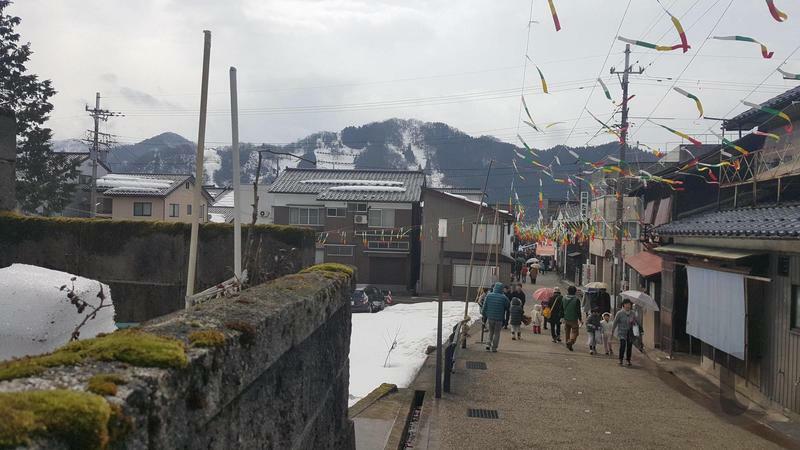 That town is called Katsuyama, a small little mountain community of roughly 23,000 people connected to downtown Fukui City by a single-track local train. 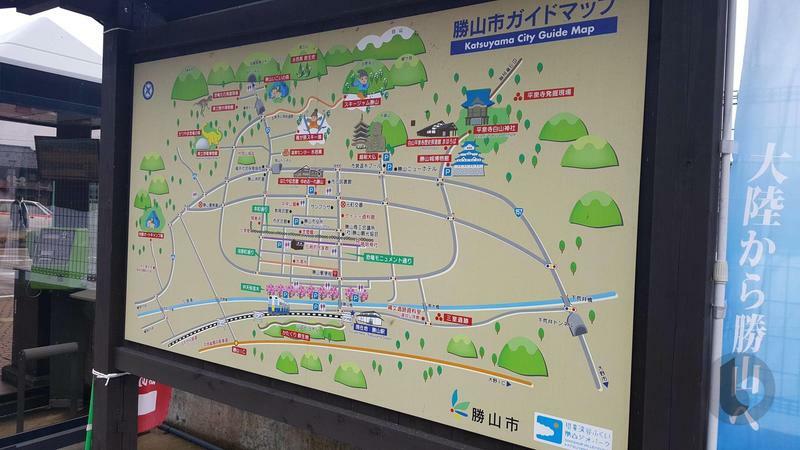 The Katsuyama Eiheiji Line takes you roughly 17.5 miles into the hills, and a $30 pass for the entire day gets you a round trip ticket on the train, free uses of the local Katsuyama buses, and entry into the museum. 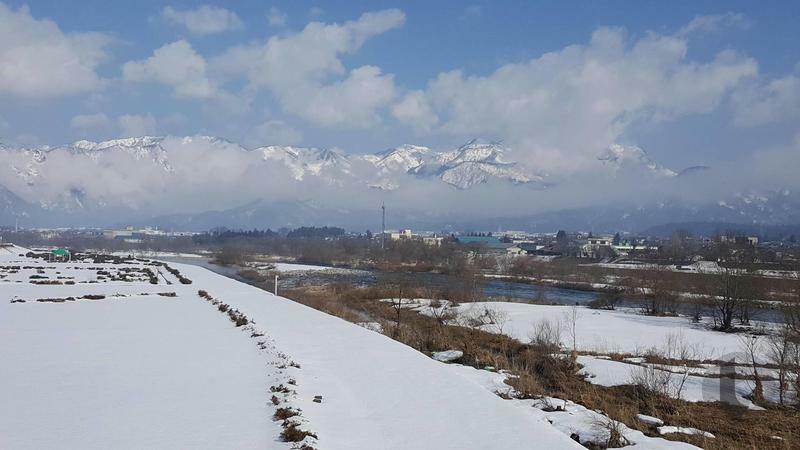 Heading there in the early morning, you can see the low clouds still setting on the summits all around and soak in the picturesque Japanese mountain scenery. 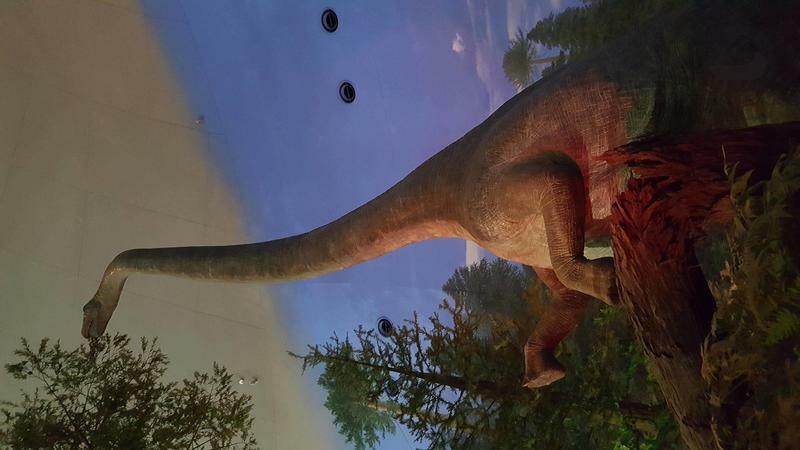 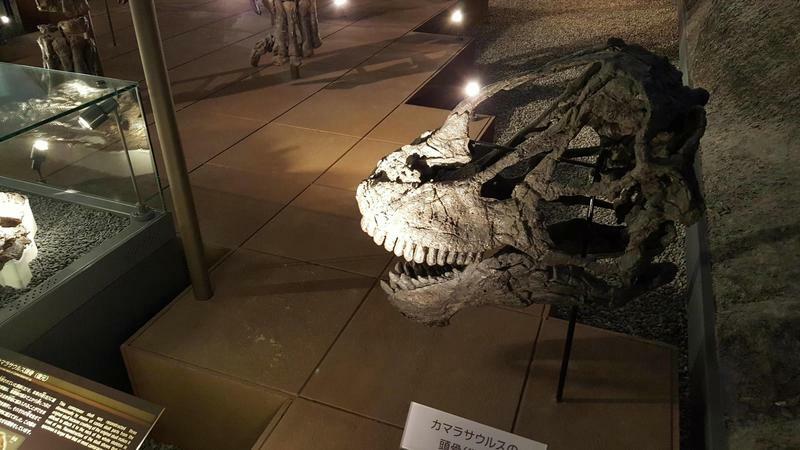 Katsuyama shocked me more than the dinosaur museum itself, and it itself turned out to be the highlight of my trip. 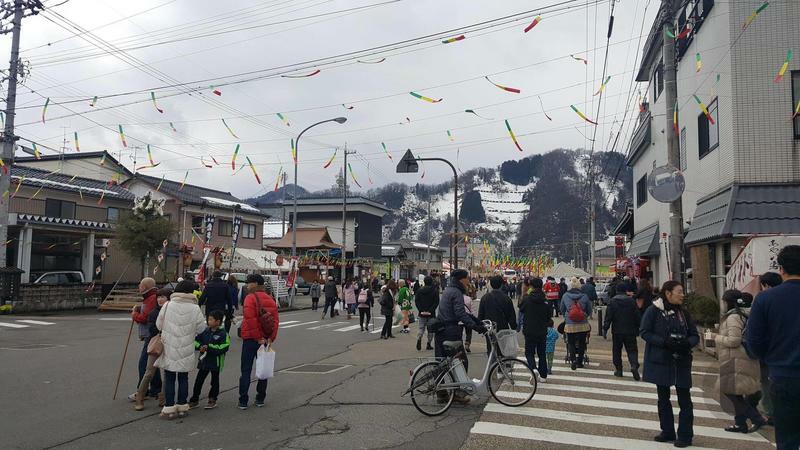 It’s the ideal Japanese mountain town (one of those ones the kids are always trying to escape from in the animes you might watch), and it’s home to a tightly knit community and rows and rows of cool, aged houses. 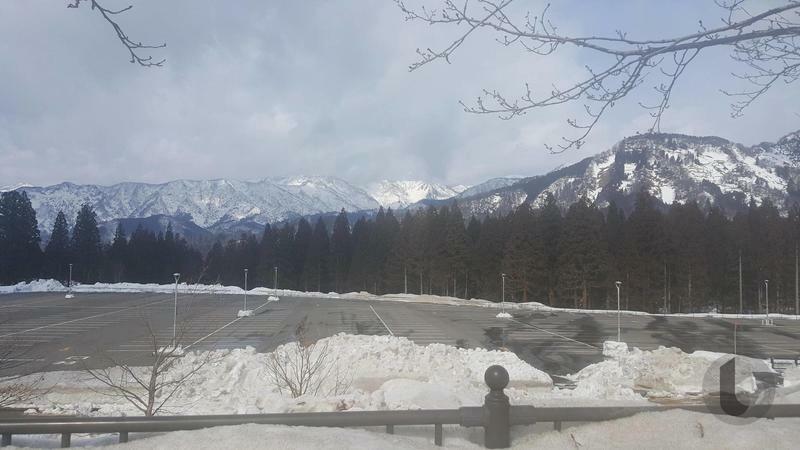 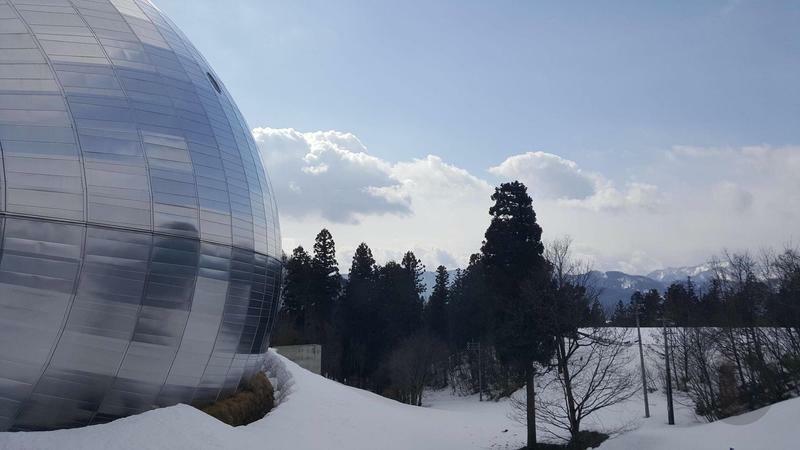 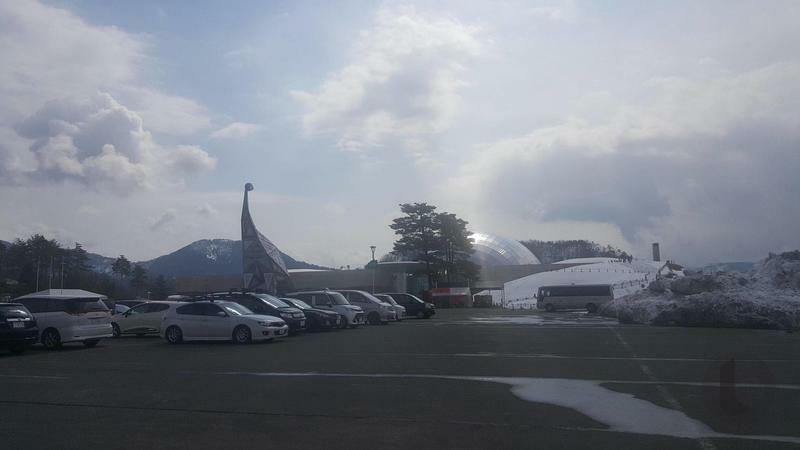 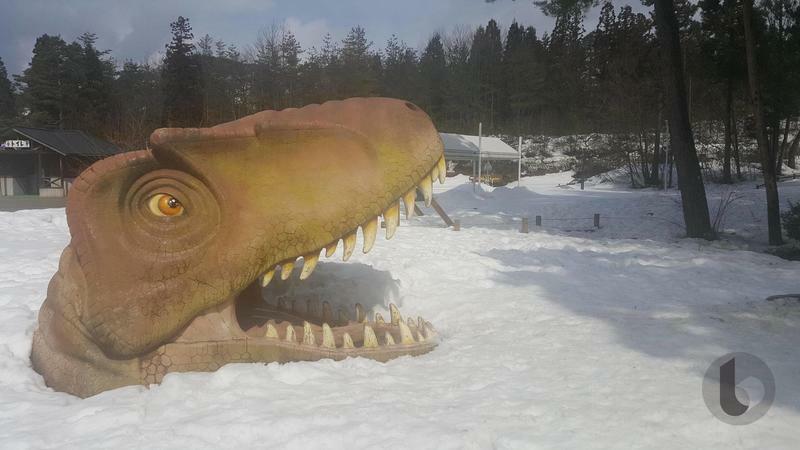 While it might seem small, it thrives on tourism thanks to not only the dinosaur museum, but also Japan’s tallest castle, giant temples and Buddha statues, countrywide famous sake breweries, its own onsen resorts, and even snowboarding slopes. 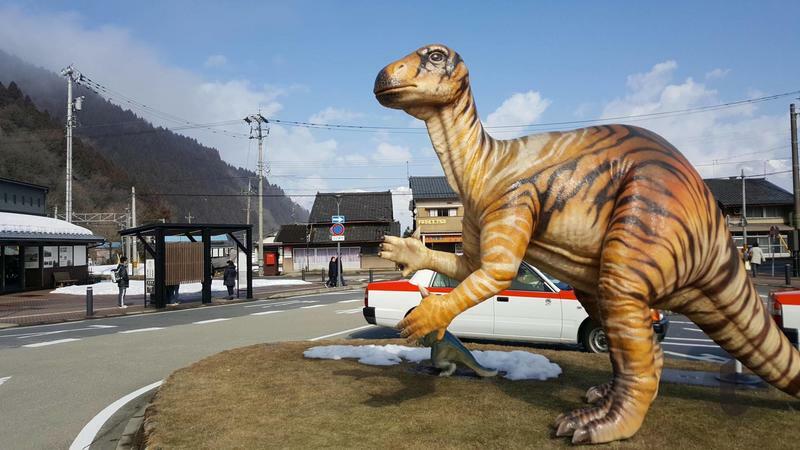 Stepping off the train, you know you’re in the right place because a giant Iguanodon statue awaits there to greet you. 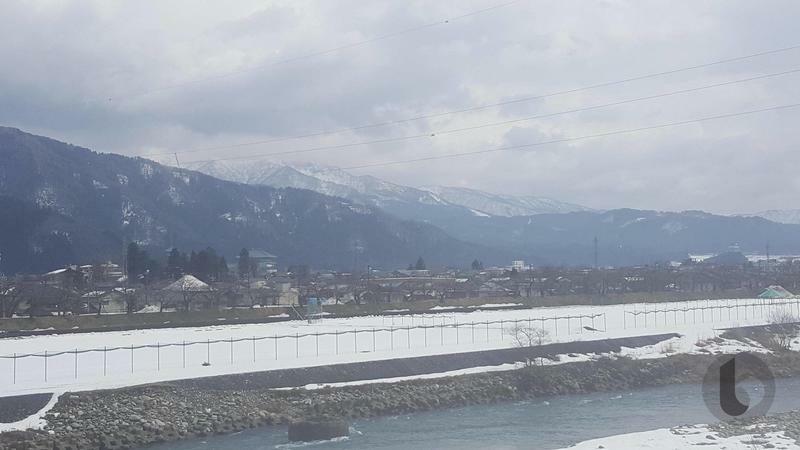 Since the bus to the museum took 15 minutes to depart, I decided to snap a few pics of the snow and distant mountains, just to get a sense how far north I was. 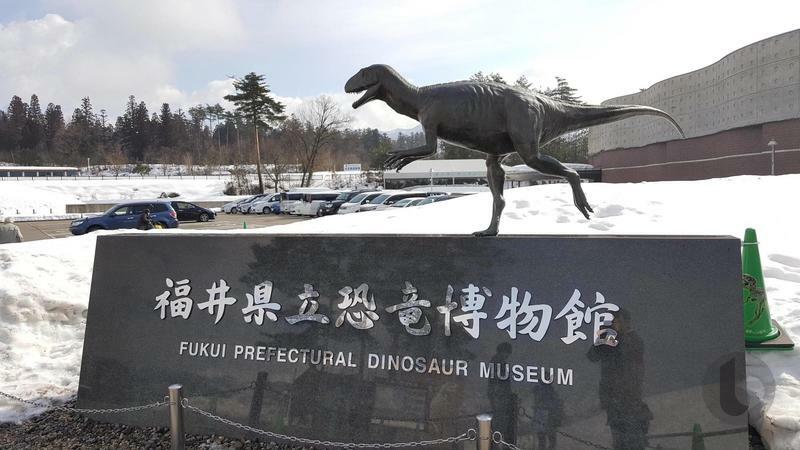 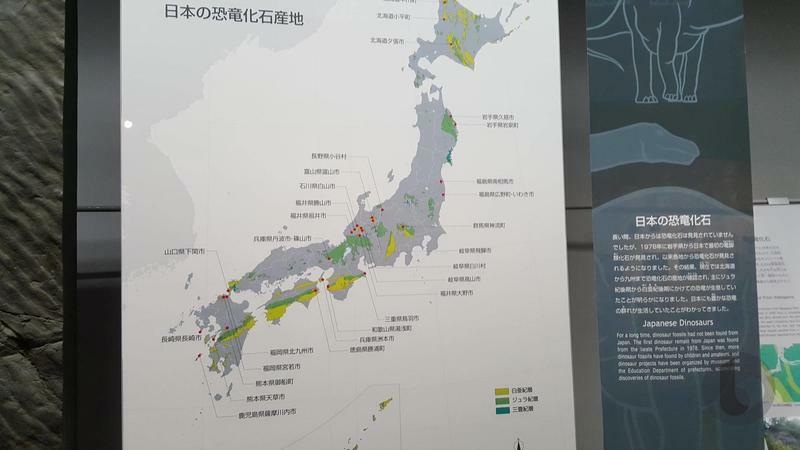 And Fukui, while north of Kobe and Osaka, really isn’t all that far north in Japan. 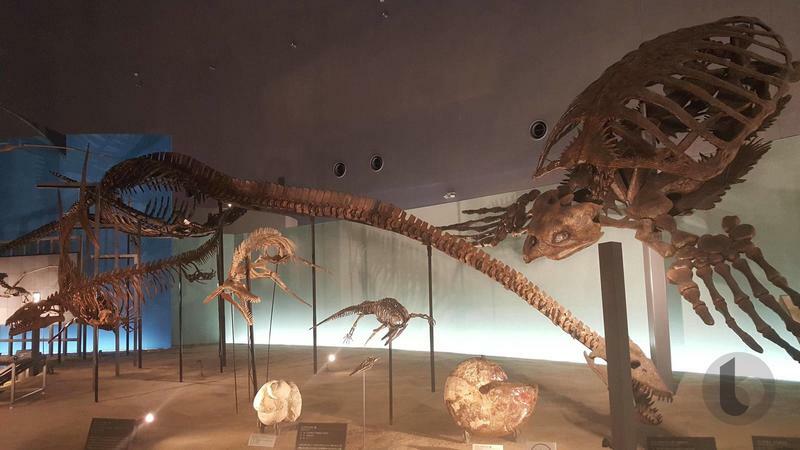 I arrived at the museum, and I was stunned at just how impressive it is. 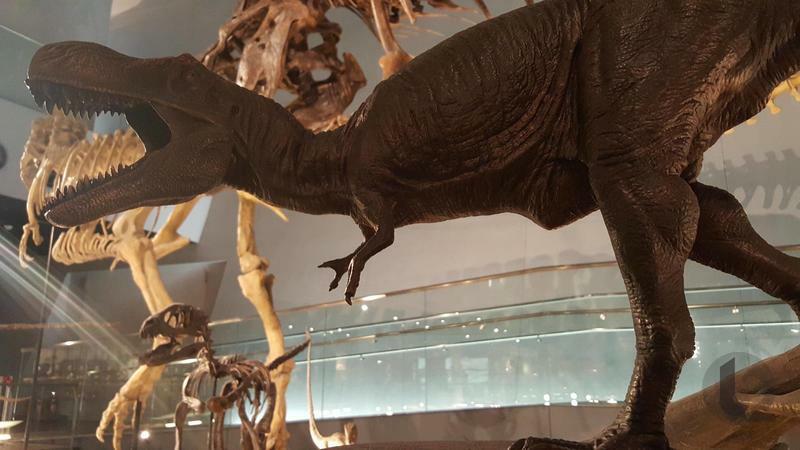 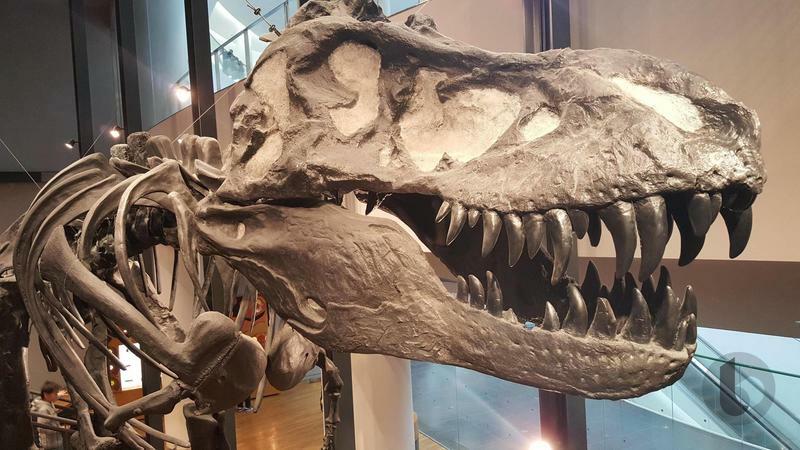 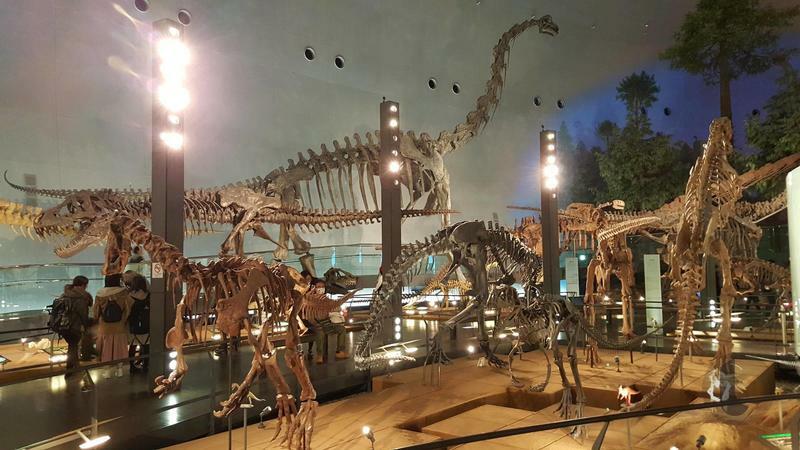 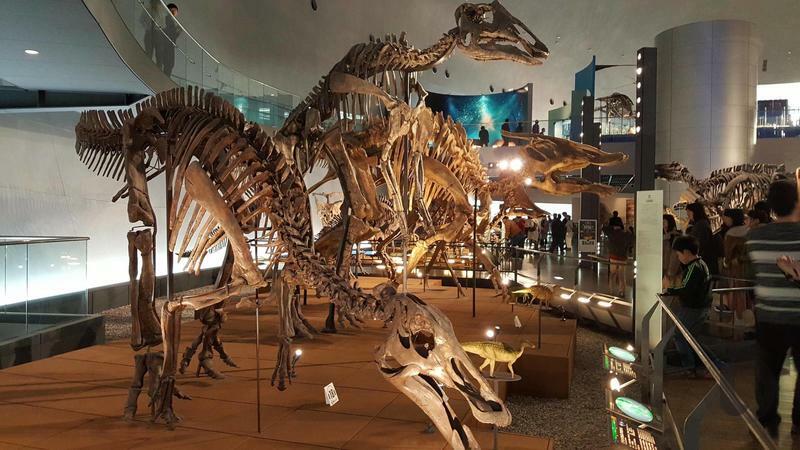 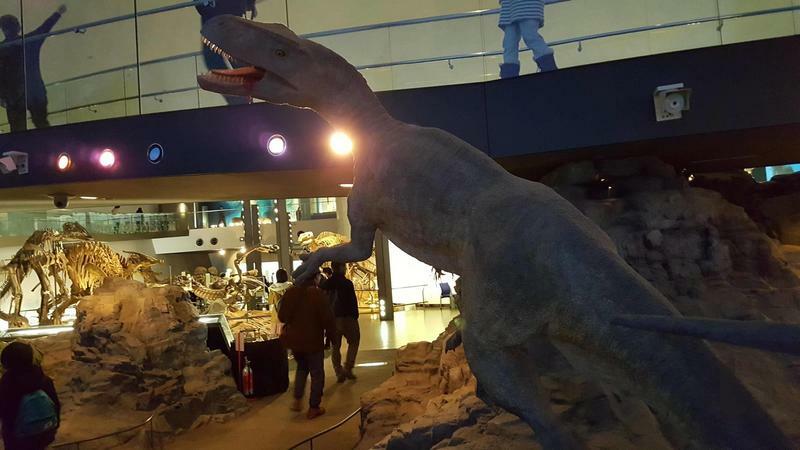 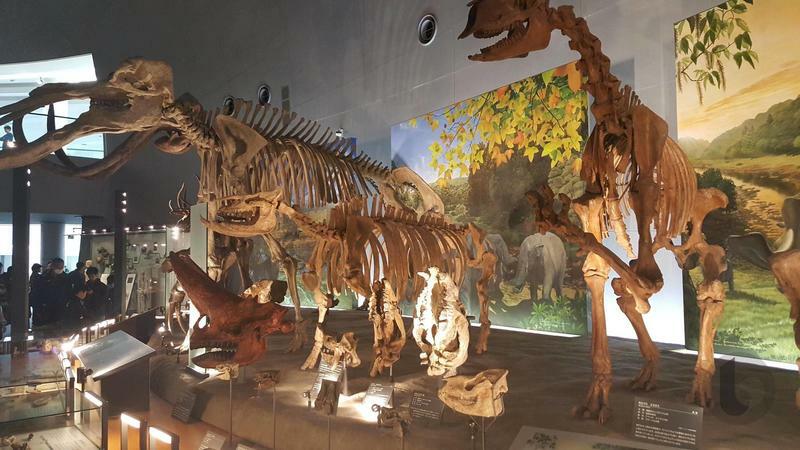 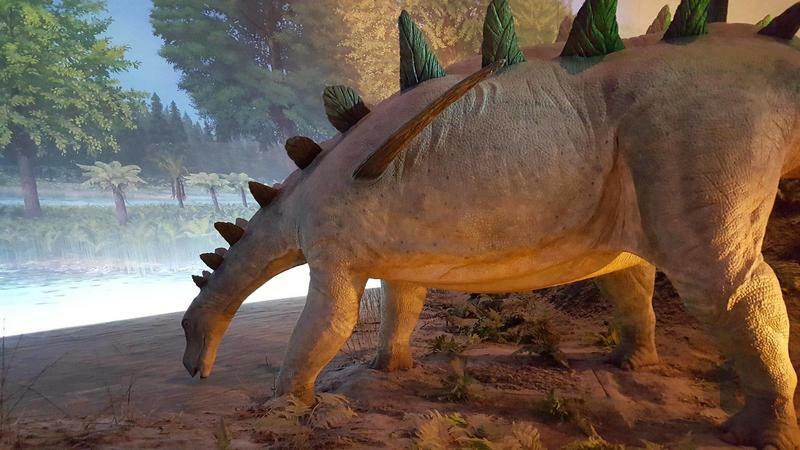 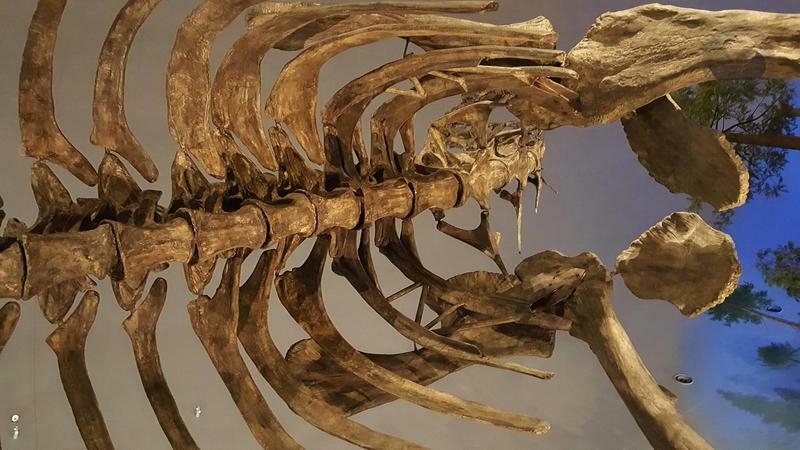 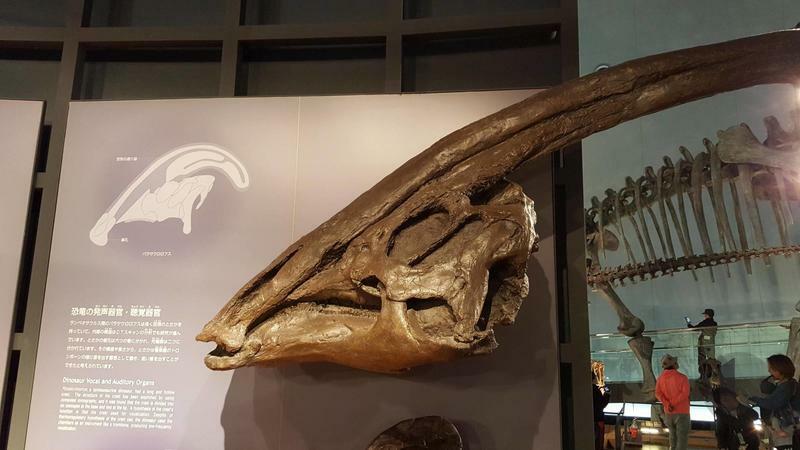 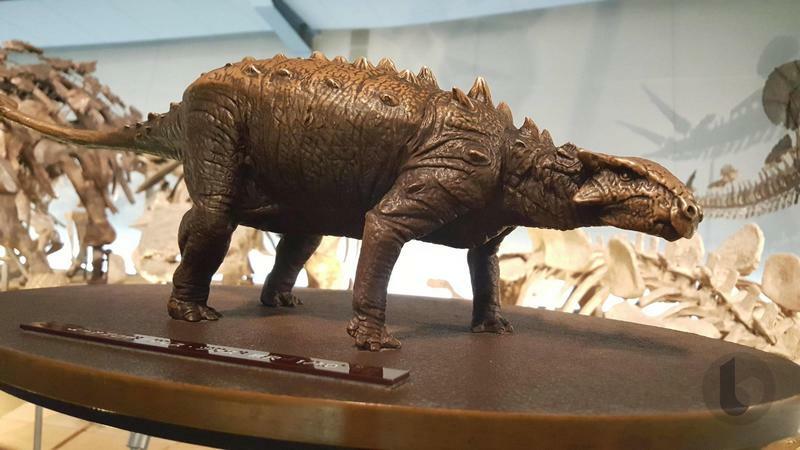 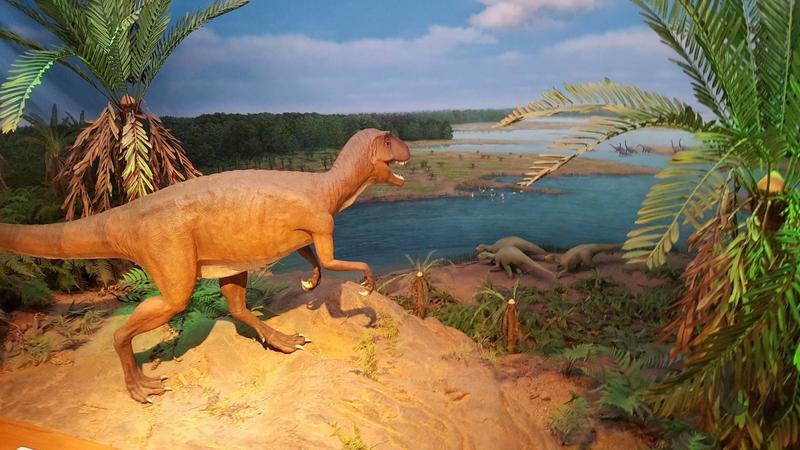 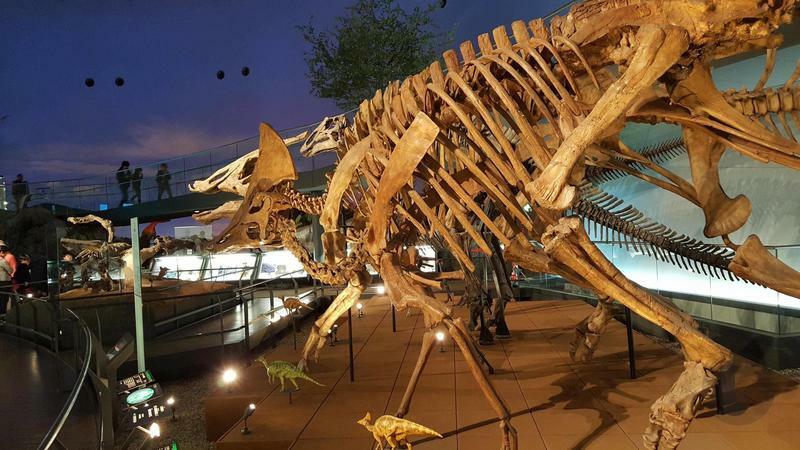 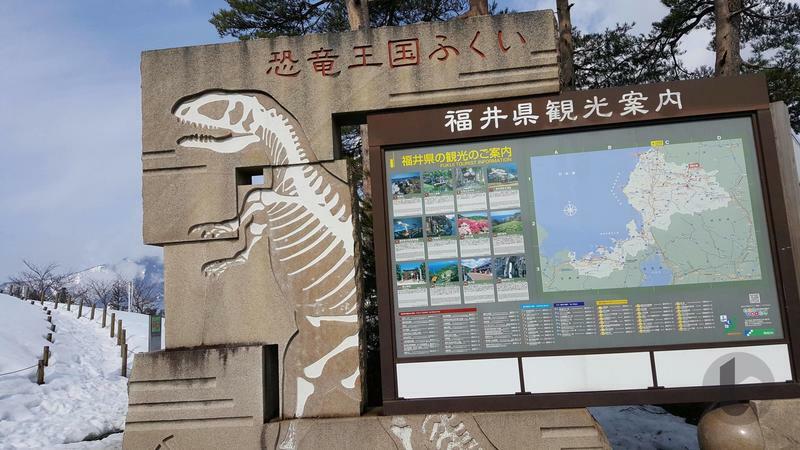 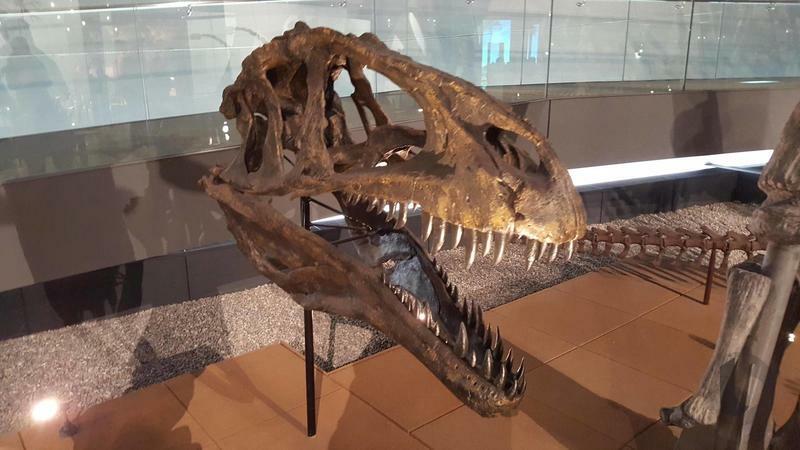 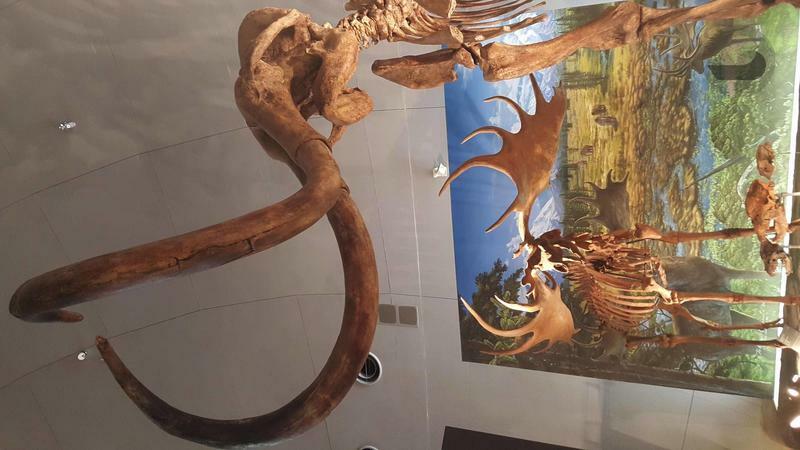 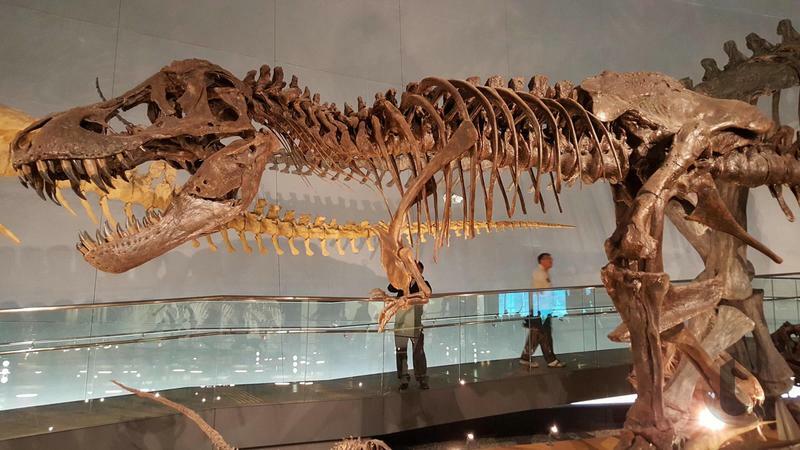 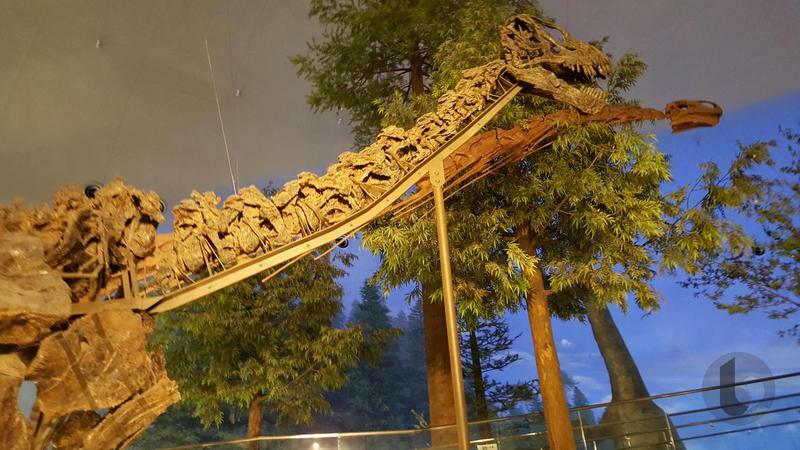 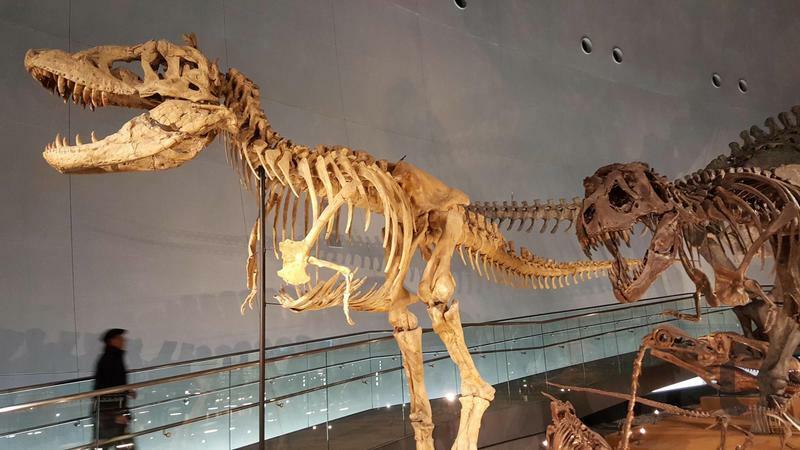 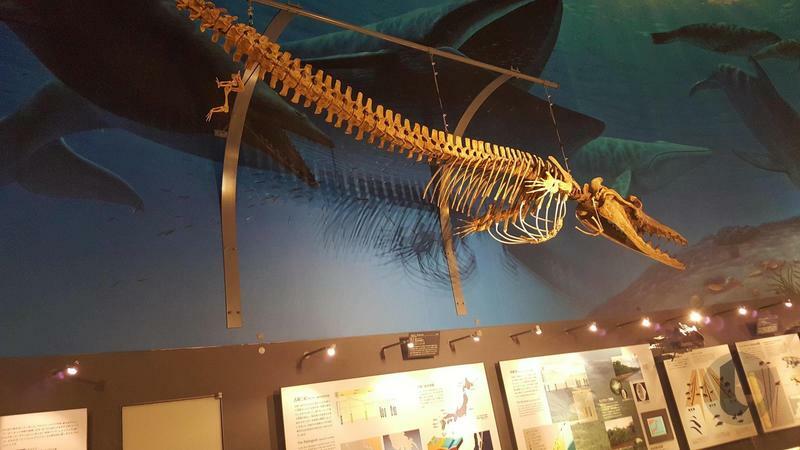 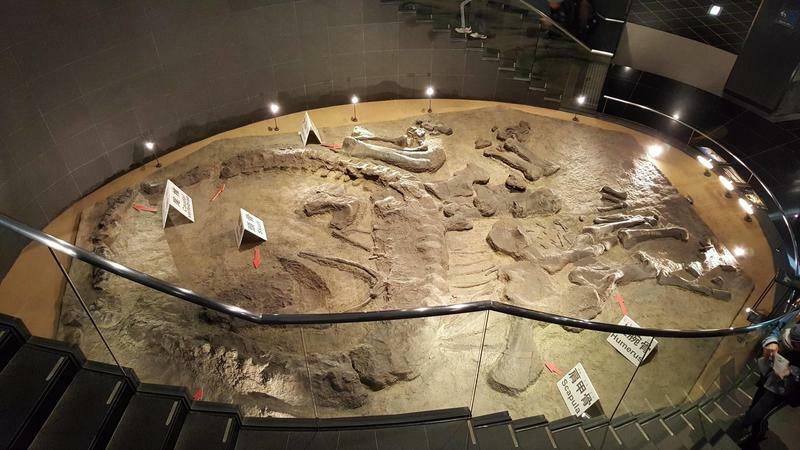 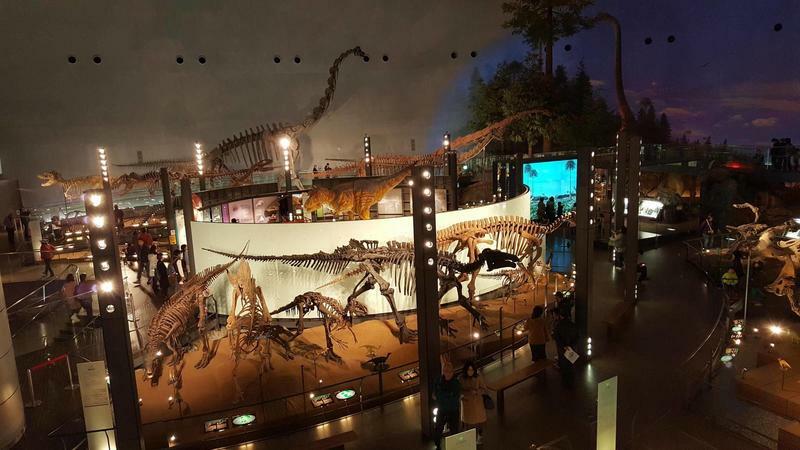 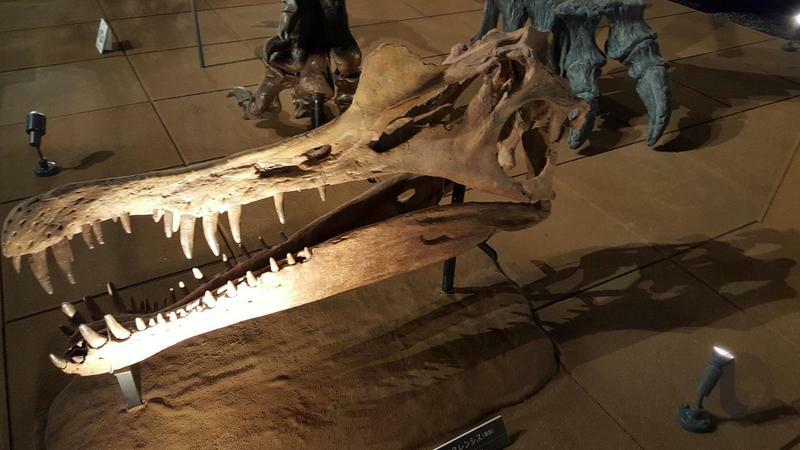 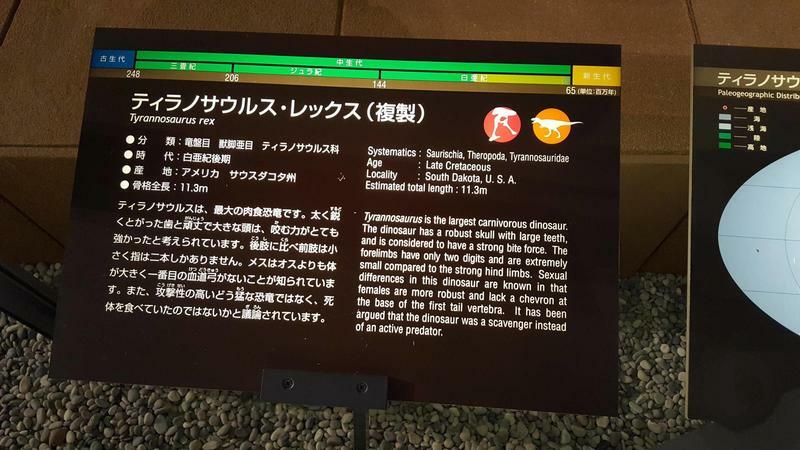 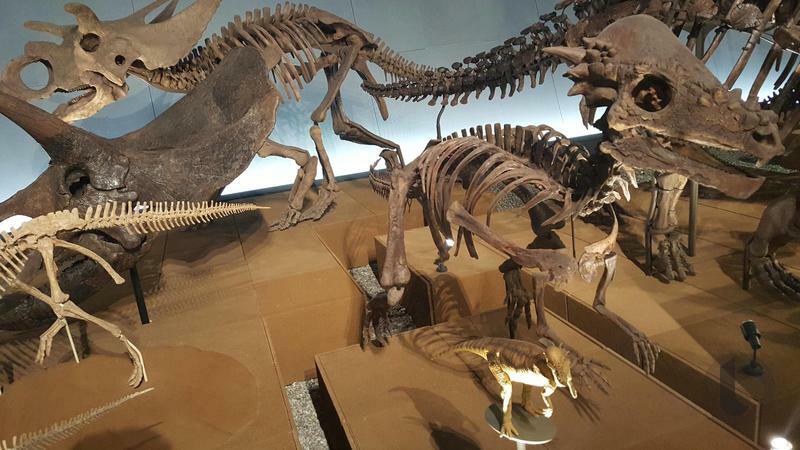 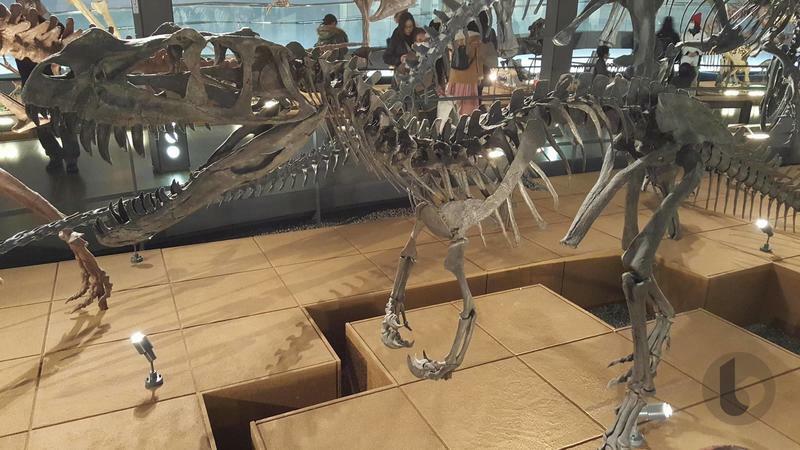 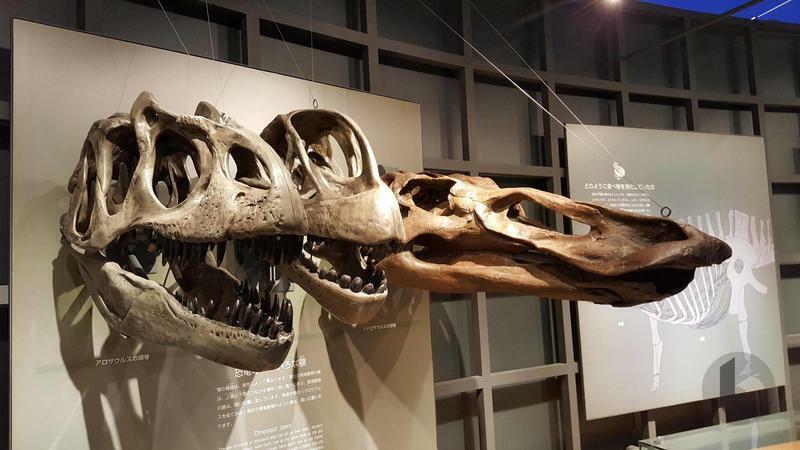 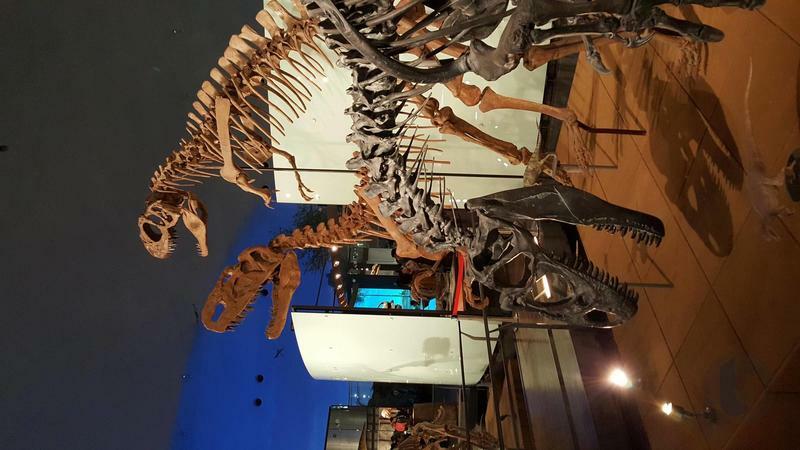 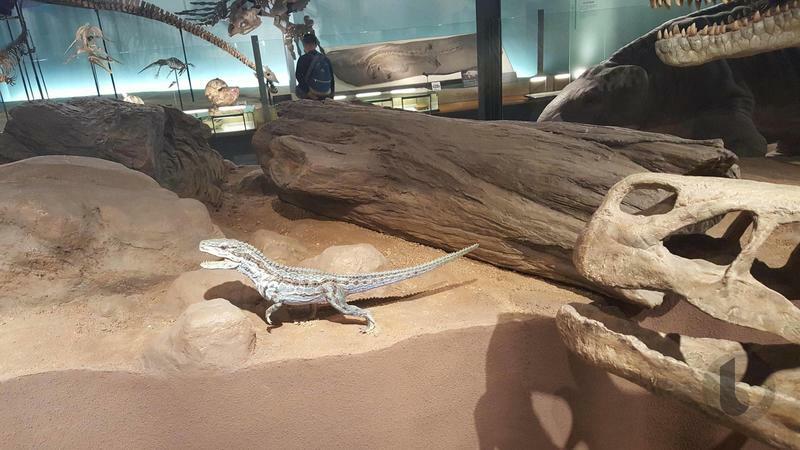 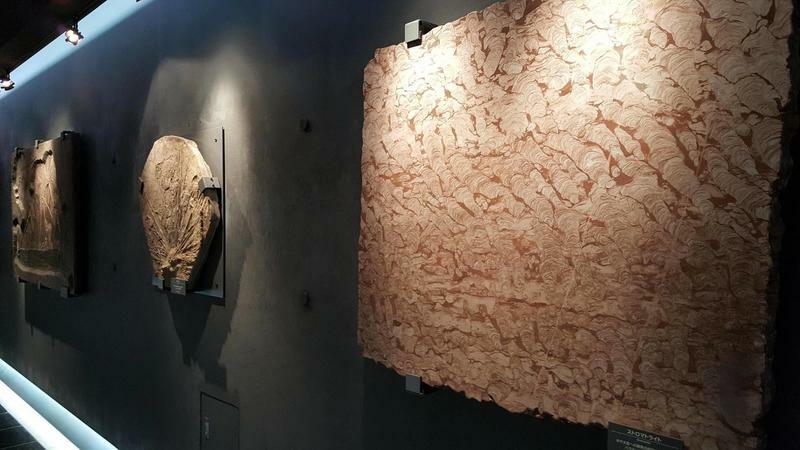 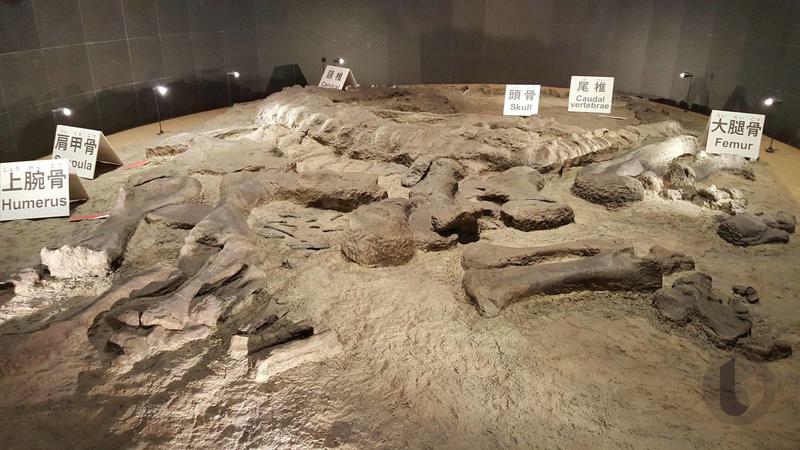 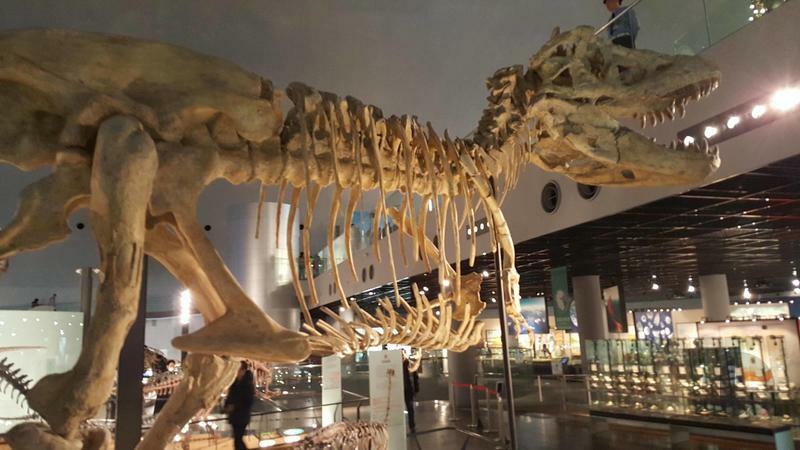 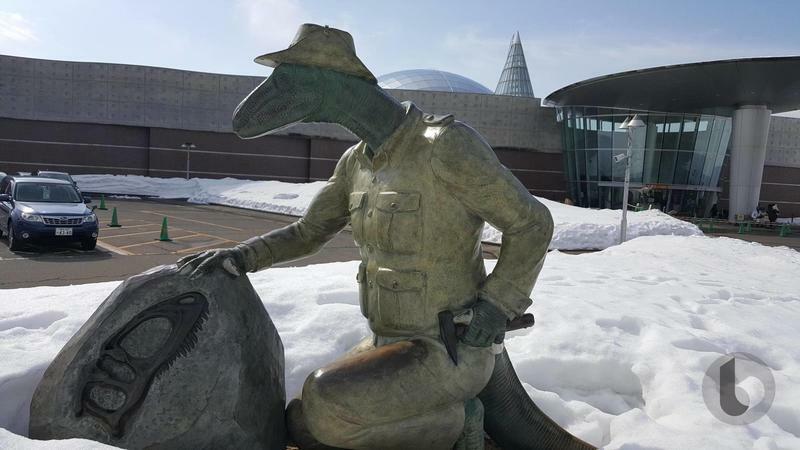 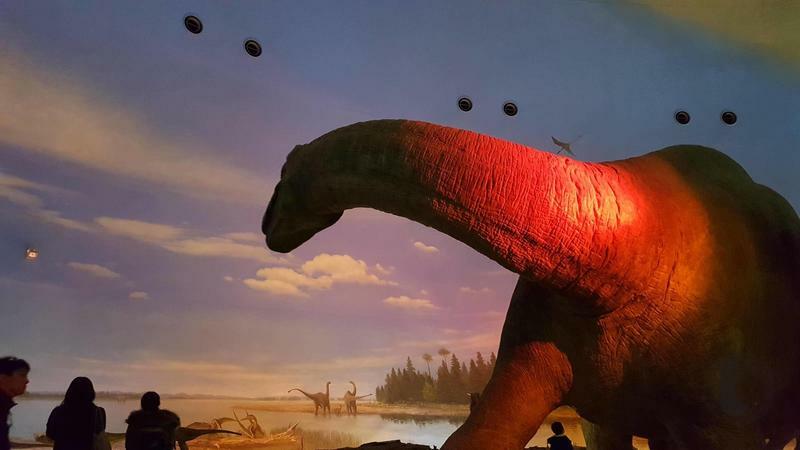 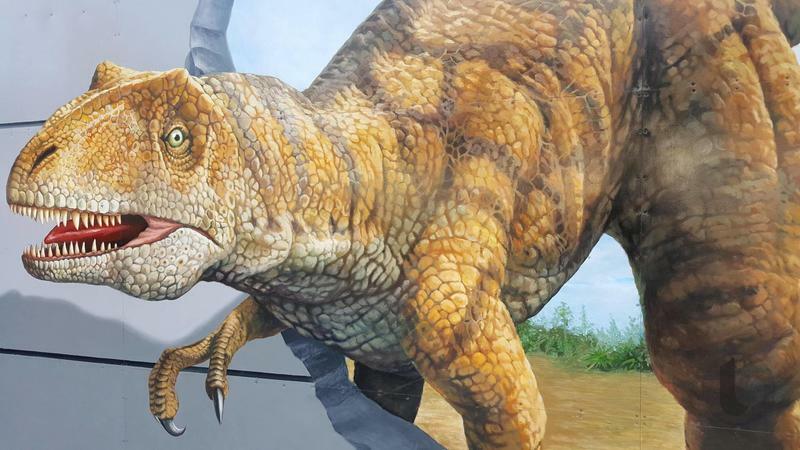 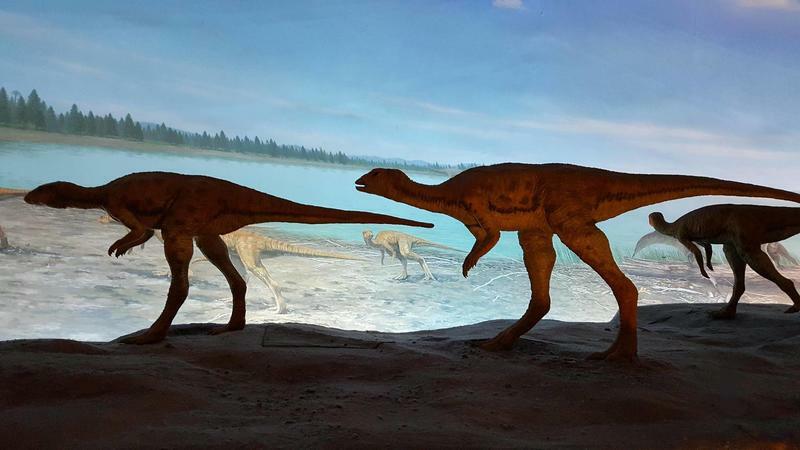 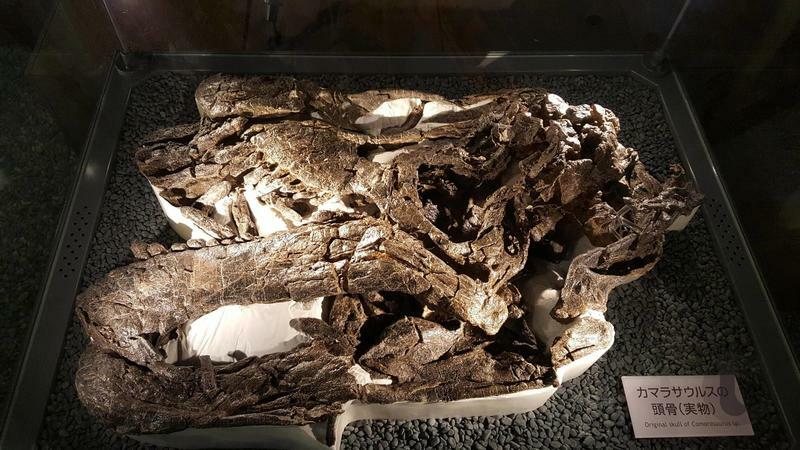 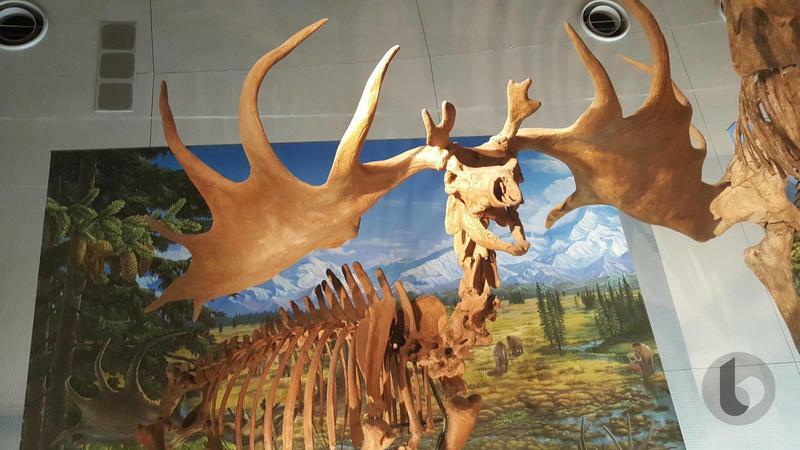 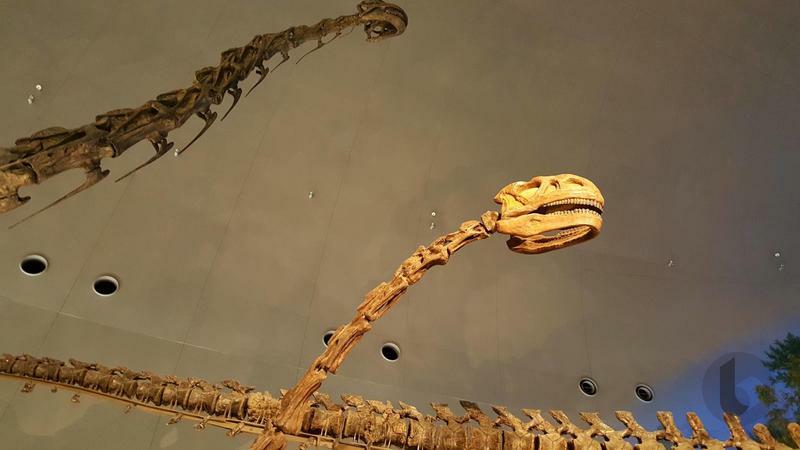 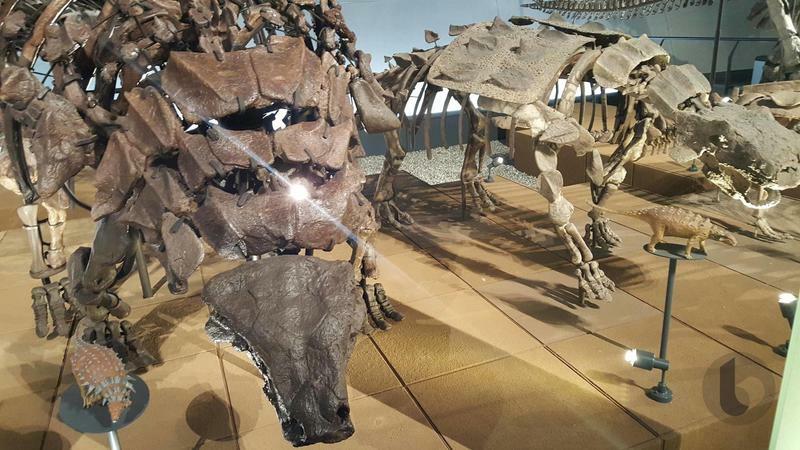 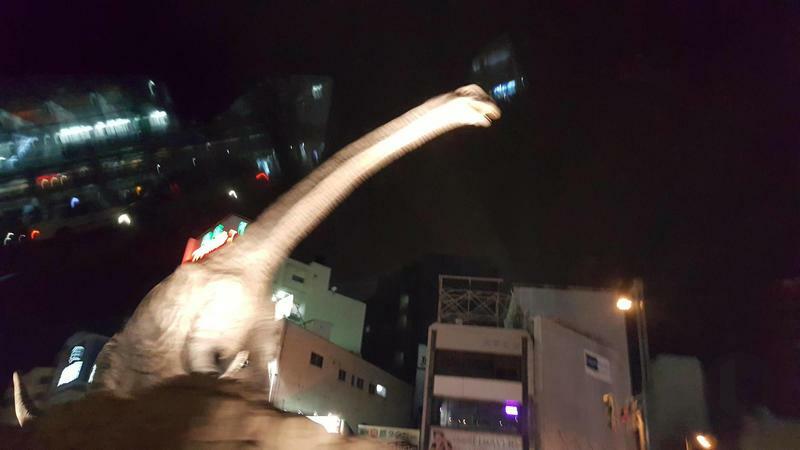 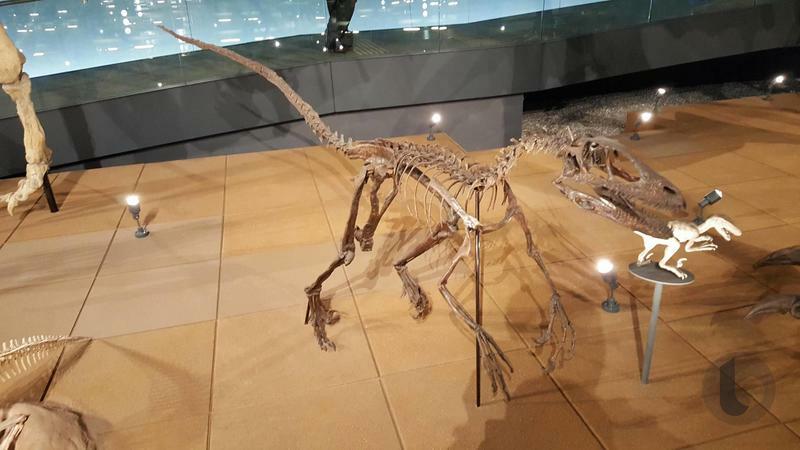 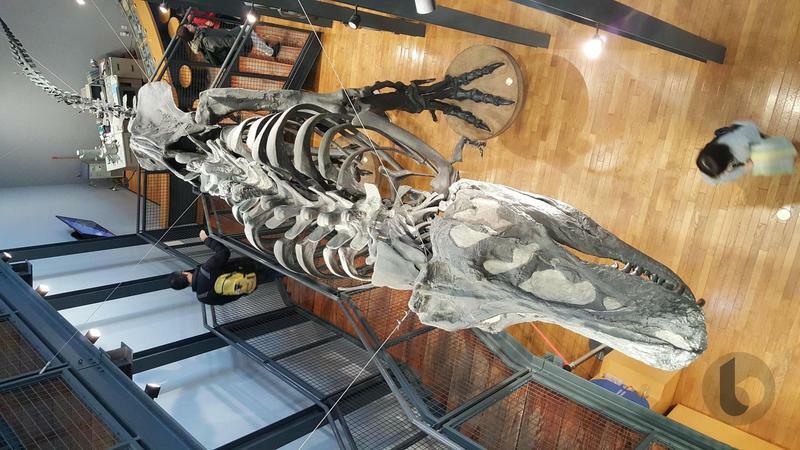 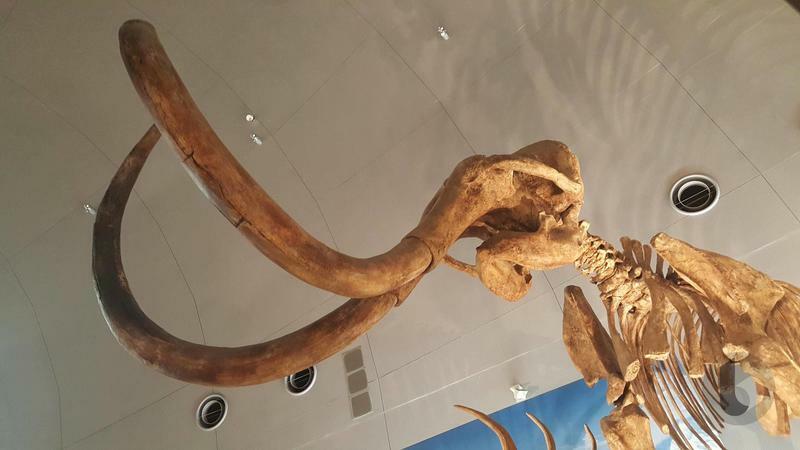 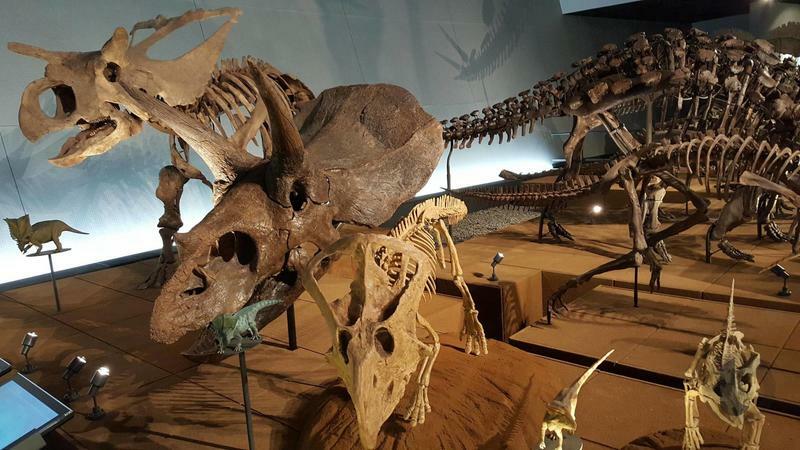 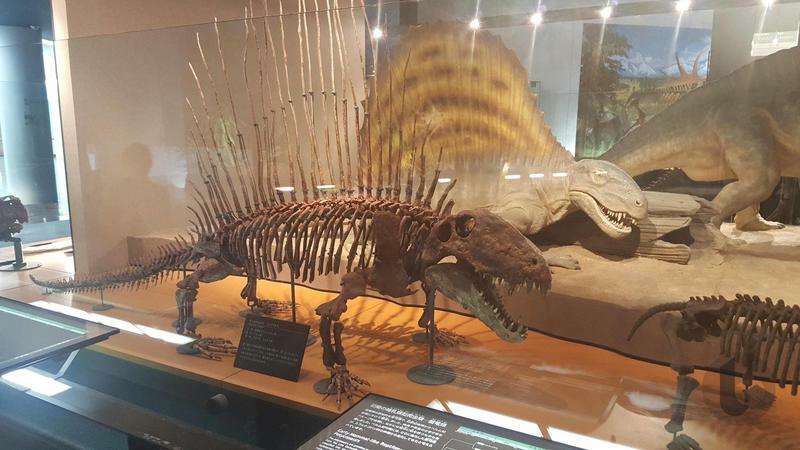 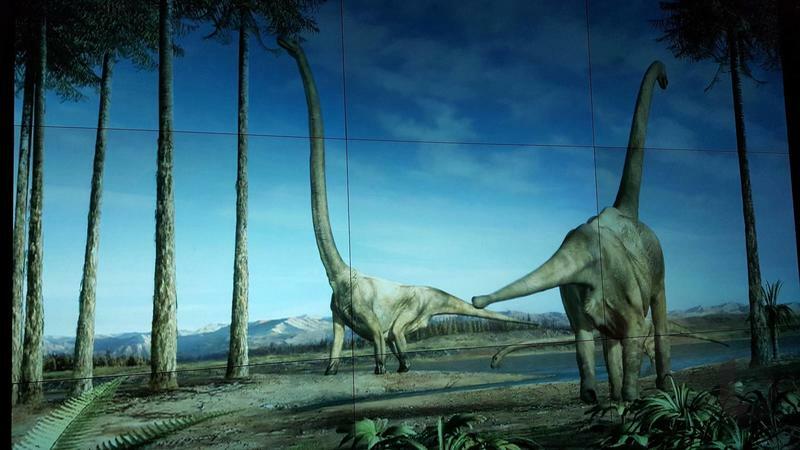 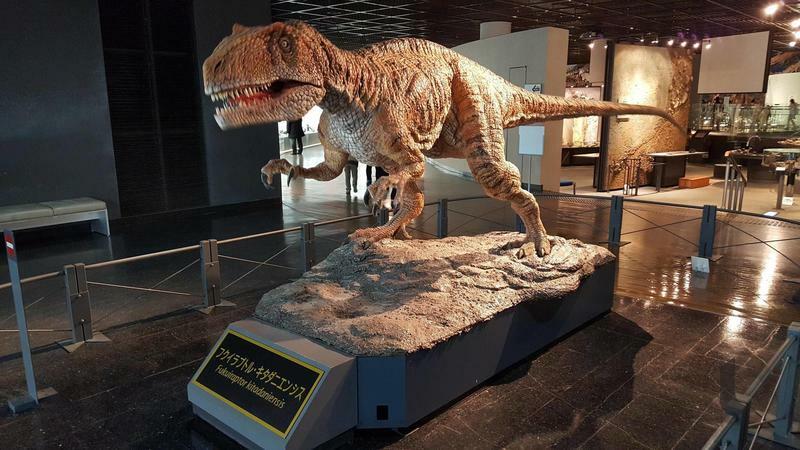 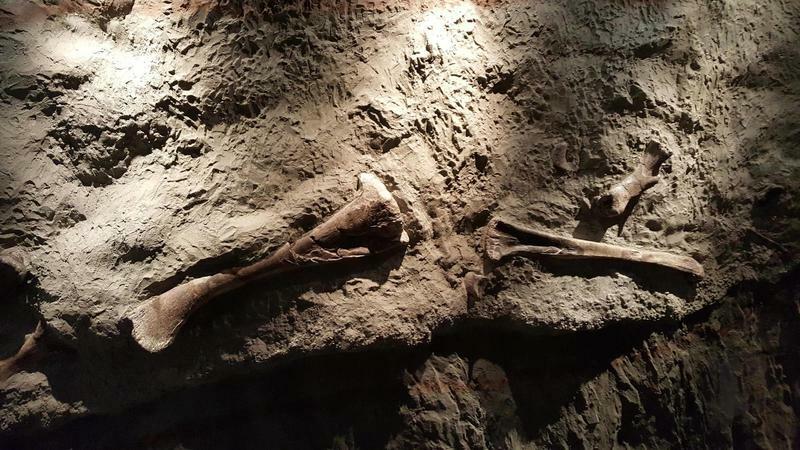 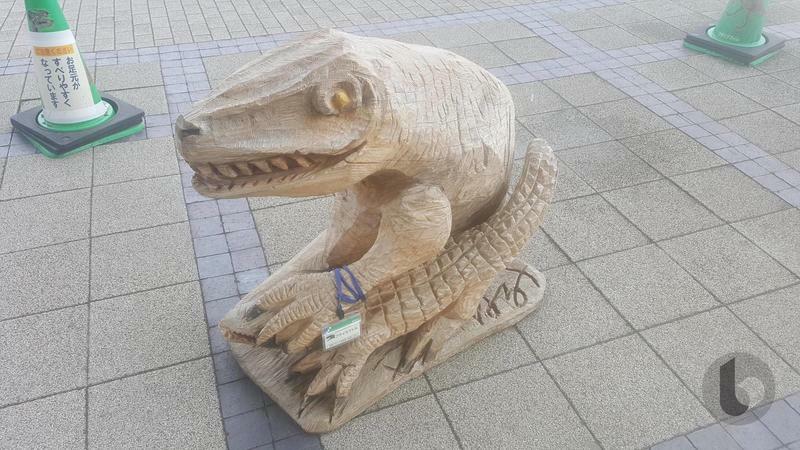 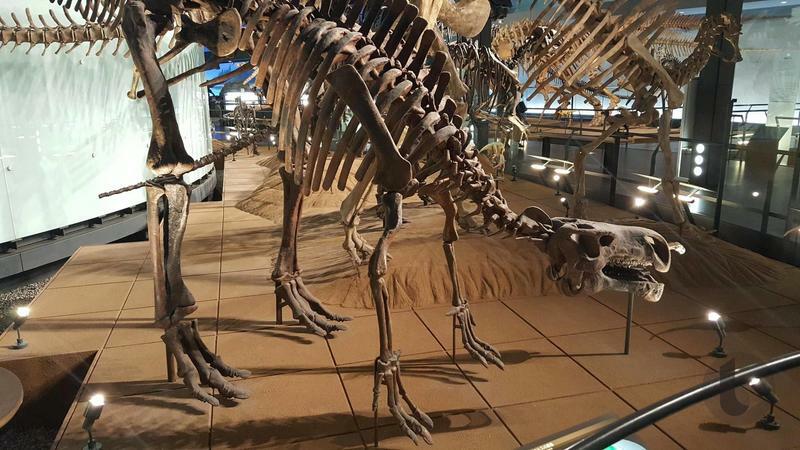 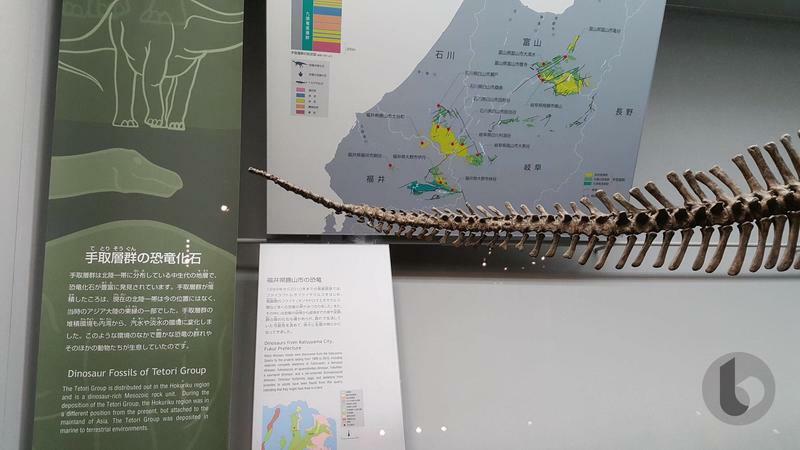 The city of Katsuyama and Fukui Prefecture both sit on top of one of the world’s richest areas for fossils, and dinosaurs can be found all over the place. 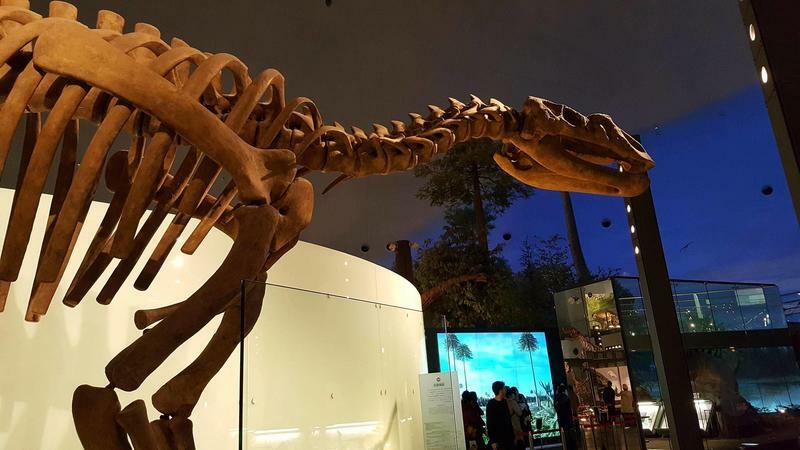 Many of the skeletons are borrowed from other museums around the world, and there is no shortage of information on them. 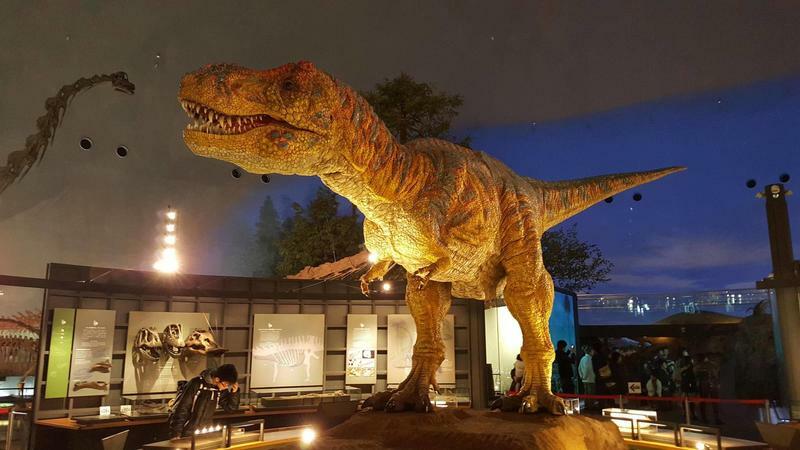 More impressive are the animatronics, with a giant Tyrannosaurus there to greet guests and send Japanese kids into a tearful frenzy. 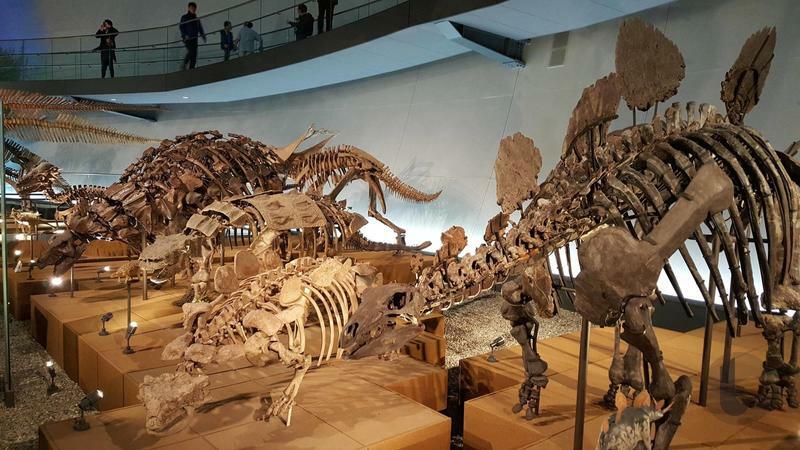 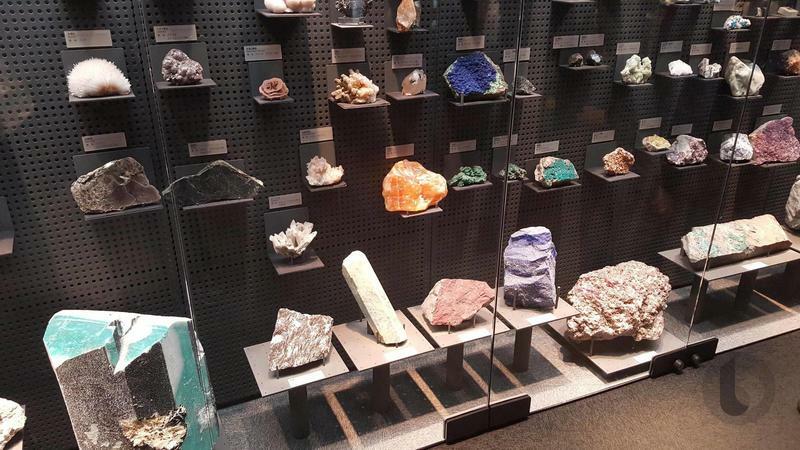 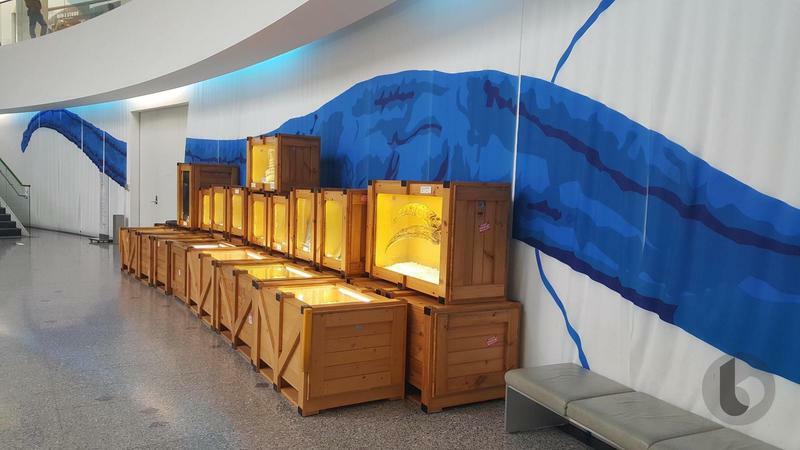 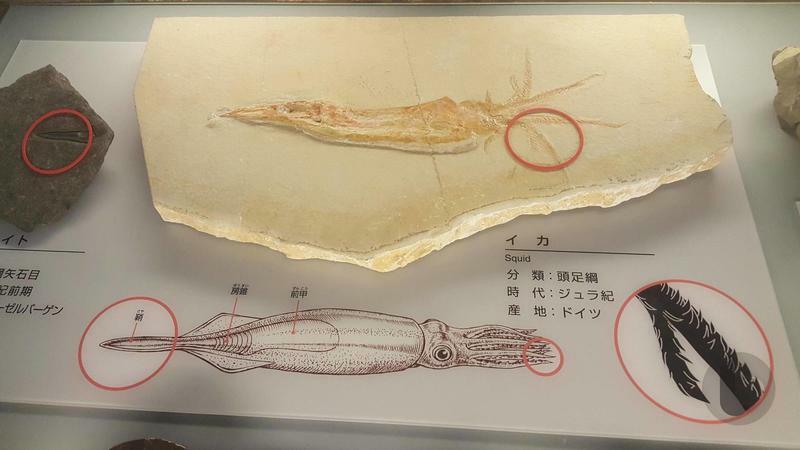 Along with all of the borrowed fossils, the museum, of course, dedicates a small section reserved specifically to the ones dug up in the local area. 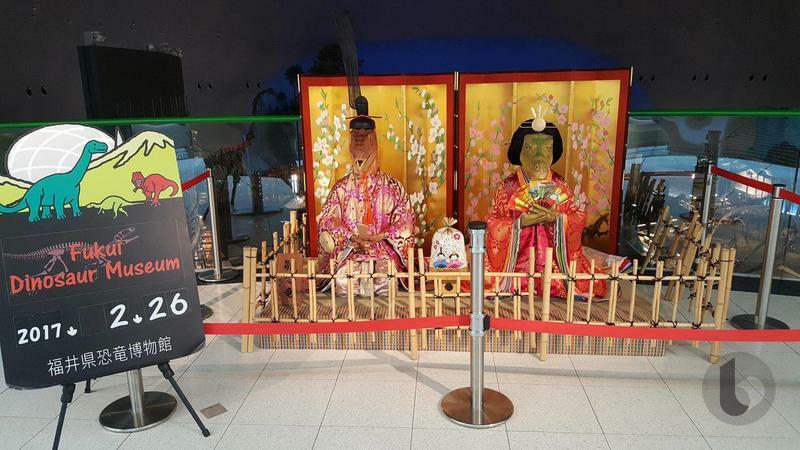 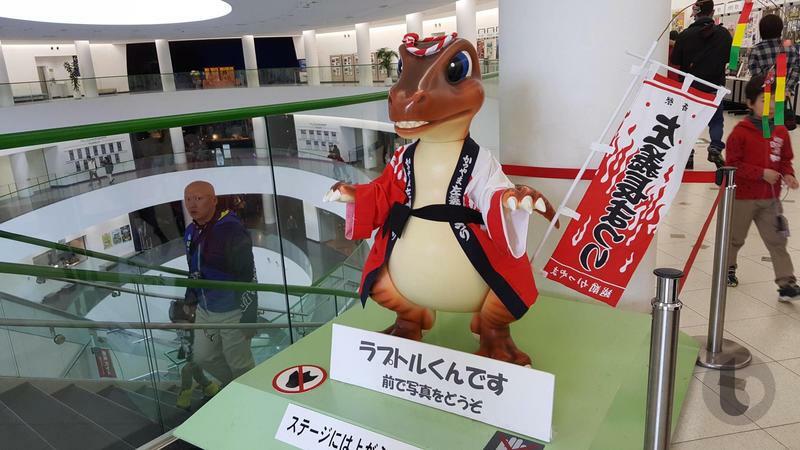 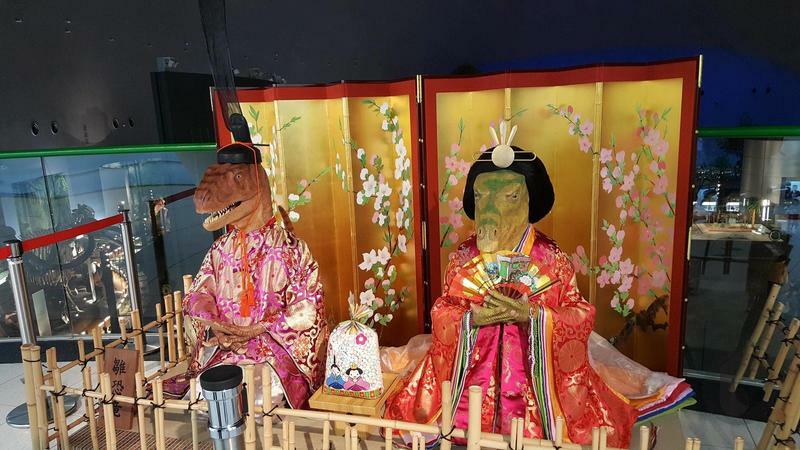 And since I was in town for the “Hina-matsuri,” or “doll festival,” which is a nationwide celebration for daughters, the museum even decked out a few of its dinosaur statues in traditional garbs. 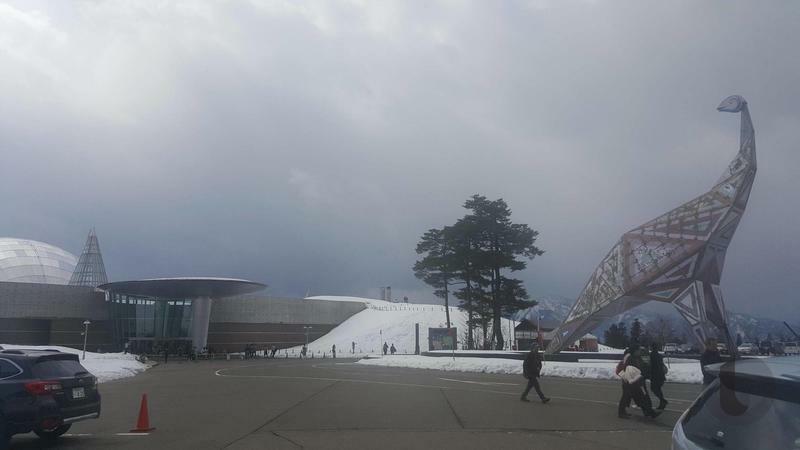 The view around the museum is also splendid with mountains upon mountains on end. 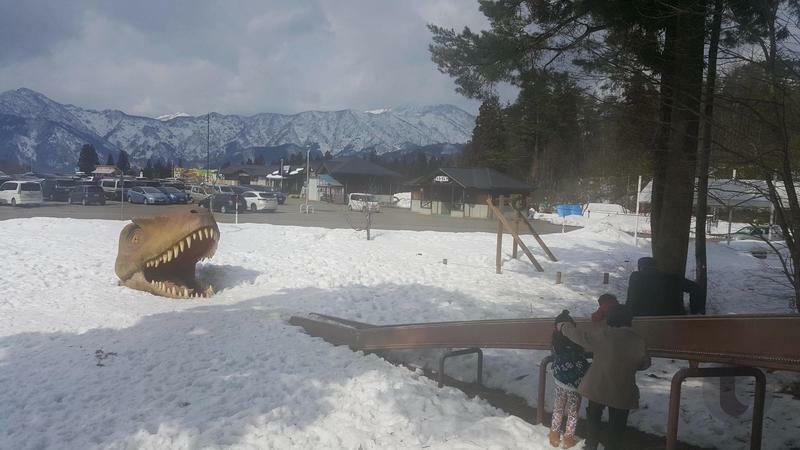 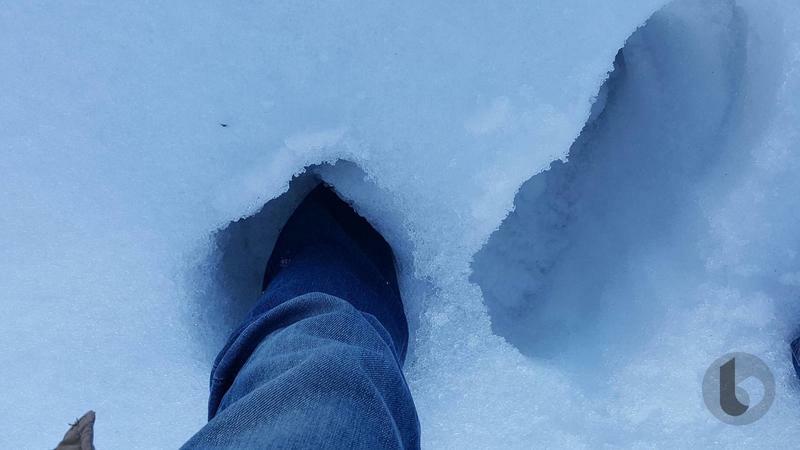 I had arrived a day or two after a huge snowstorm rocked the town since dinosaur-high snowdrifts had been piled up around the circumference of the parking lot. 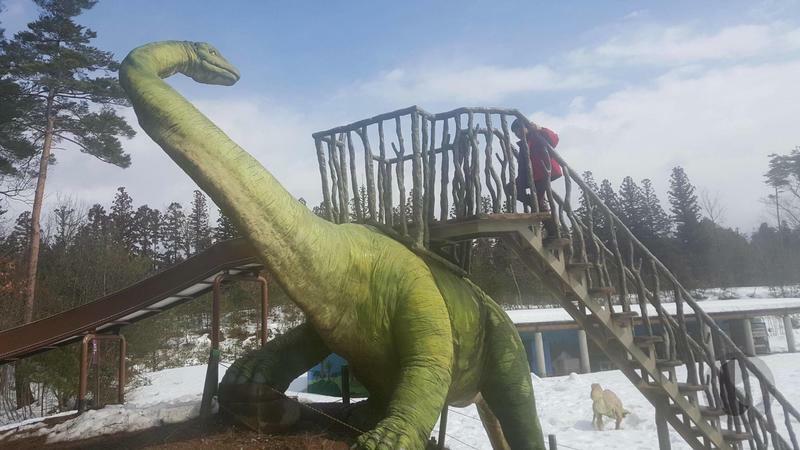 And, I can’t forget the playground outside the museum, which is stacked with fun dinosaurs and a rolling slide that lands you right in a Tyrannosaurus’ mouth. 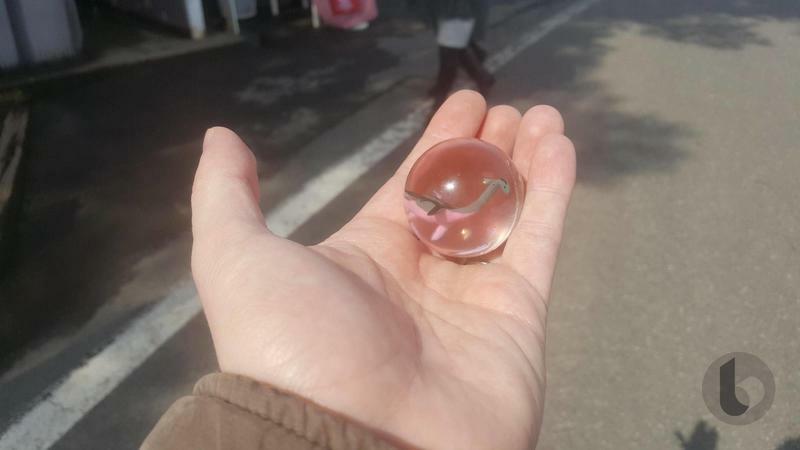 After having my fill of dinosaurs and landing myself a sweet super ball from the gift shop, I originally intended to hike my way over to the castle and temples. 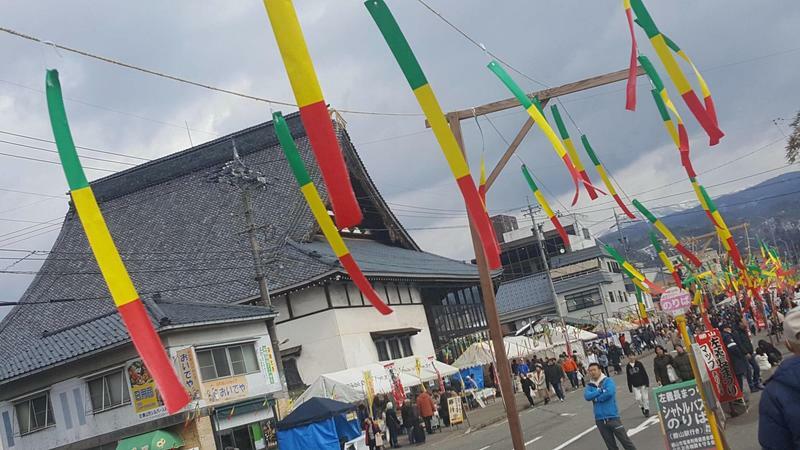 However, after arriving back at the train station, I realized that I had planned my trip coincidentally the same weekend as the Katsuyama Segicho Festival. 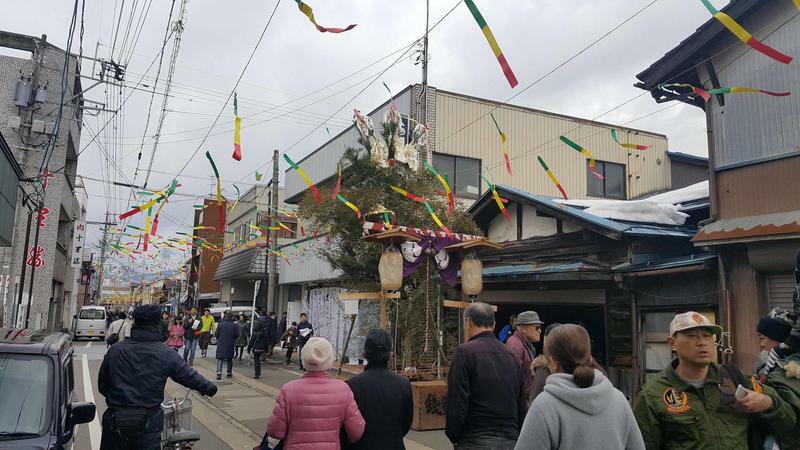 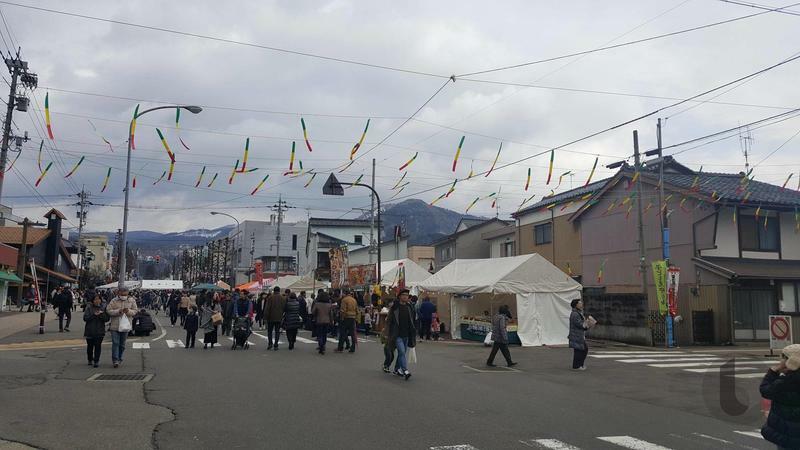 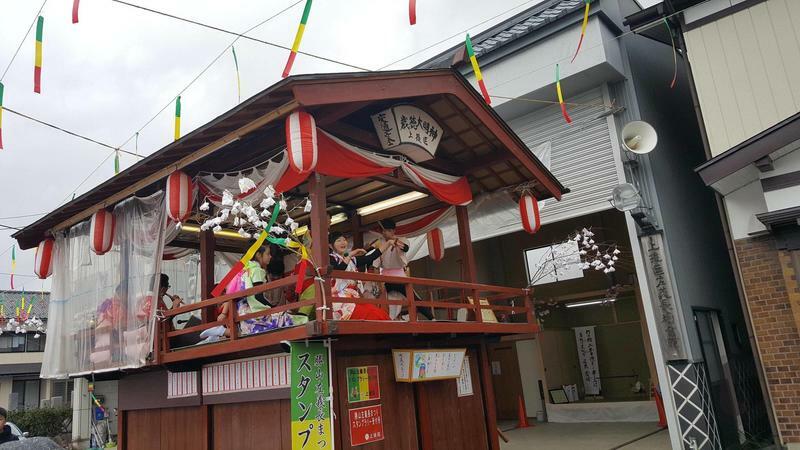 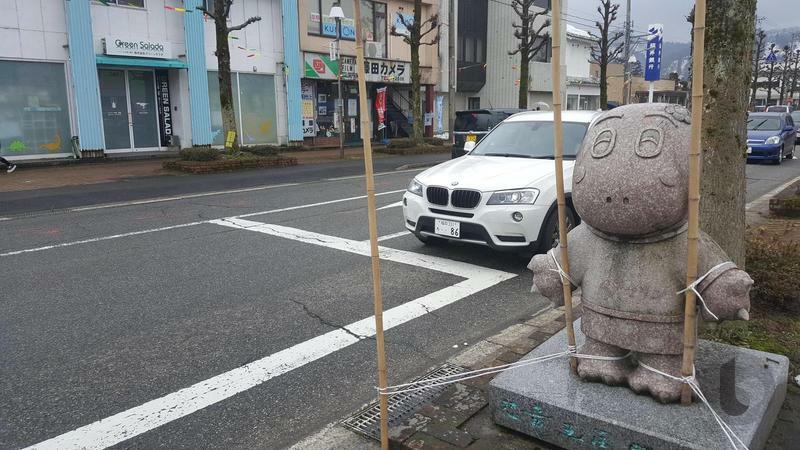 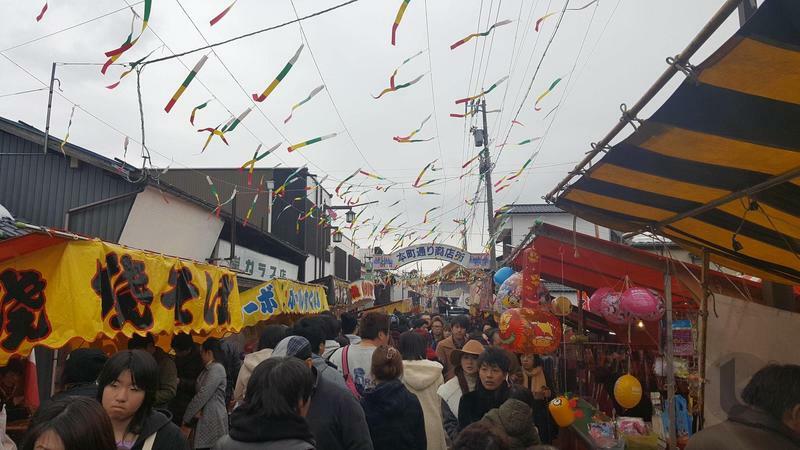 The town has held this celebration for the last 300 years to celebrate the coming spring, and it involves a lot of drinking, socializing, and wacky antics. 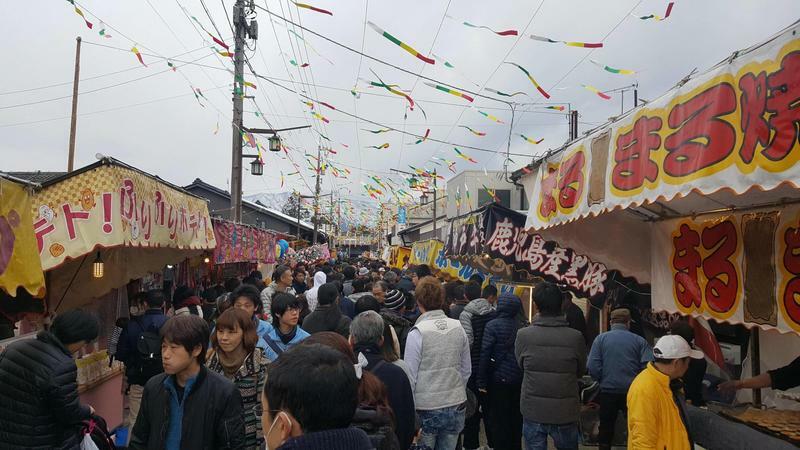 If you’ve never been to a local Japanese festival, you’re really missing out. 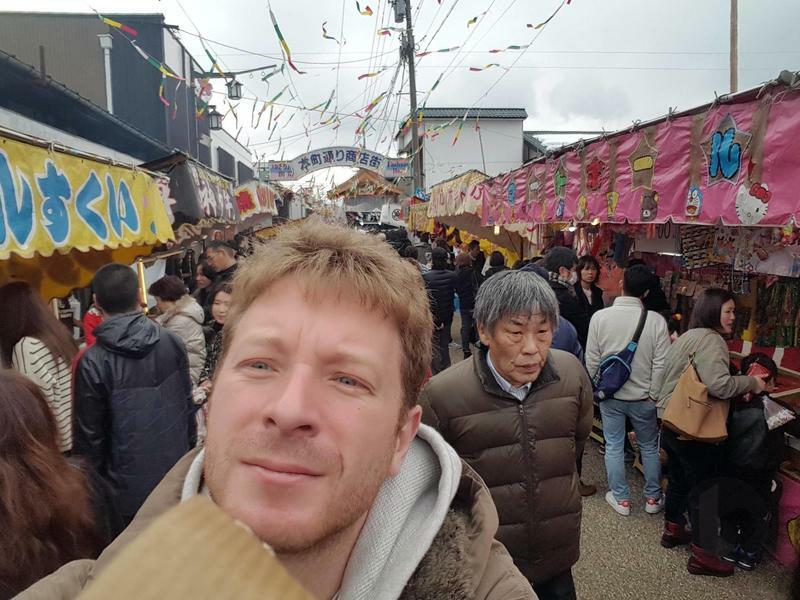 Singing, dancing, streets jam packed with locals and food stalls, called “yattai” in Japanese, sell the greasiest, most delicious food you’ll find in Japan. 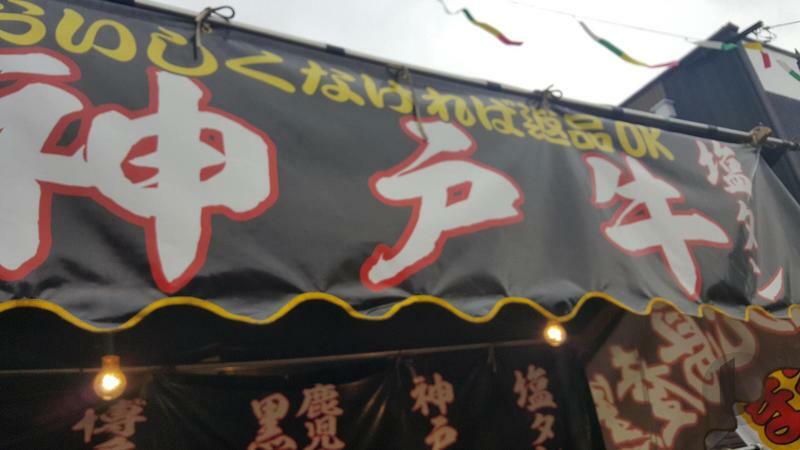 “Karage” Chinese-style fried chicken, grilled meat on a stick, “yakisoba” a kind of fried noodles with special sauce, “takoyaki” octopus in a fried ball of batter, and the best of all, “Okonomiyaki” loosely translated as “cooking you like.” It’s often described as “Japanese pizza,” but it’s cabbage, pork, eggs, and whatever you want, fried up in a little pancake. 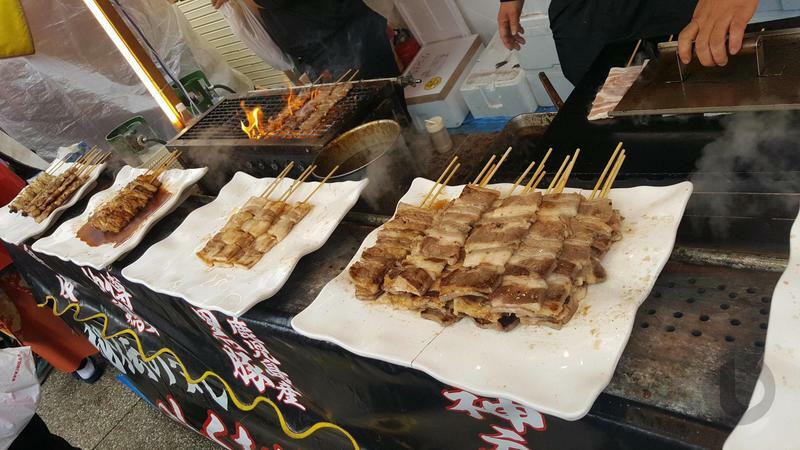 Okonomiyaki sauce and mayonnaise are like a festival for your taste buds. 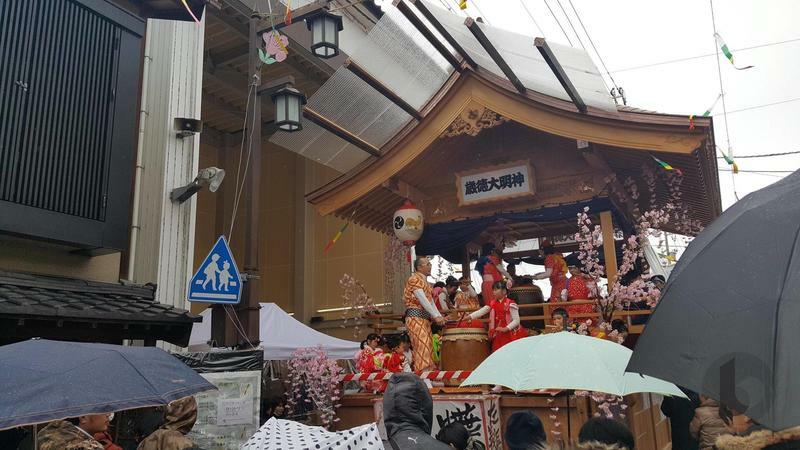 So even though the sky opened up a little and it started to drizzle, the town was in full bloom. 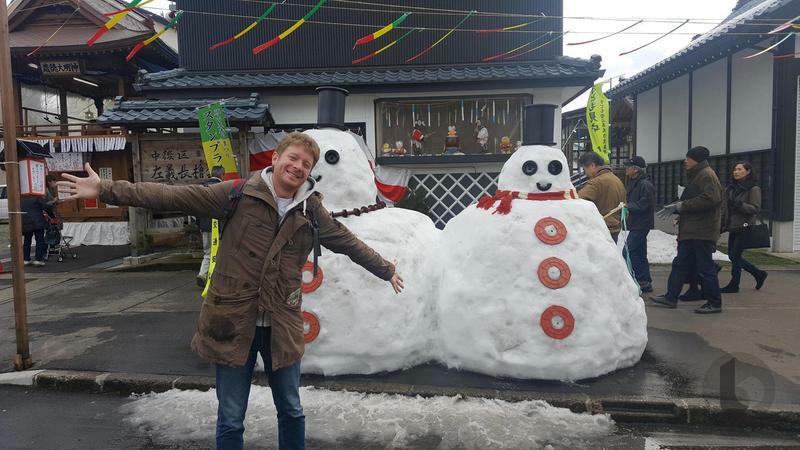 Everyone was out celebrating, and I decided to make the rounds and chat with a few locals. 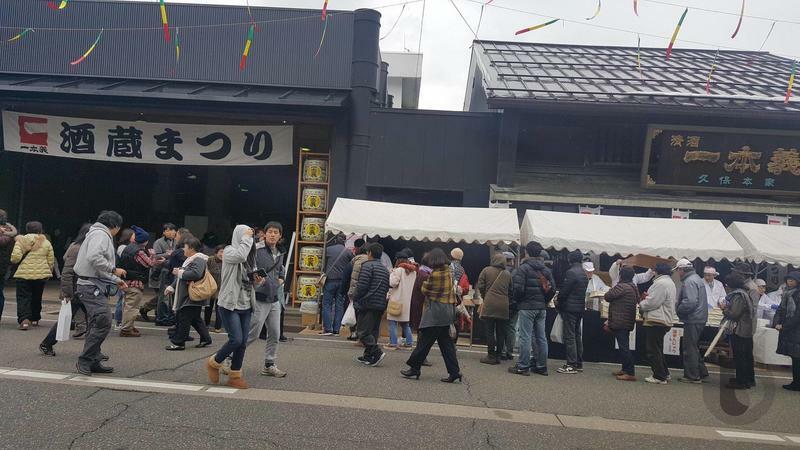 Being a stranger in a strange land, plenty of these “yattai” offered me free or discounted samples of their food and sake, which I was not rude enough to refuse. 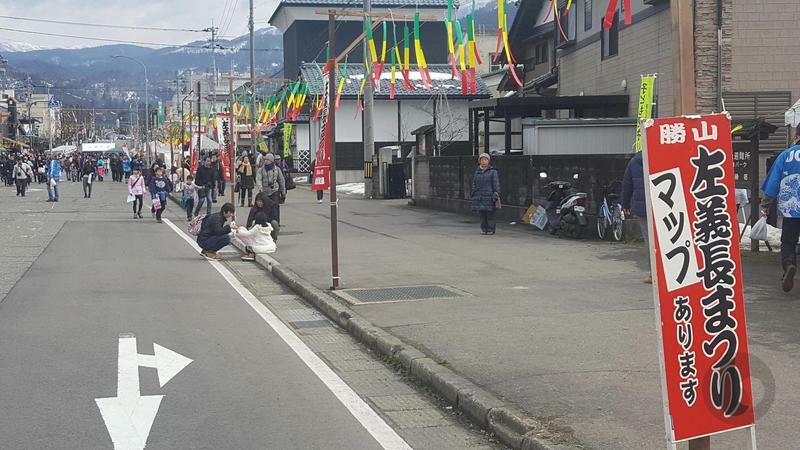 The only place that was not free was the central brewery, one of the town’s claims to fame. 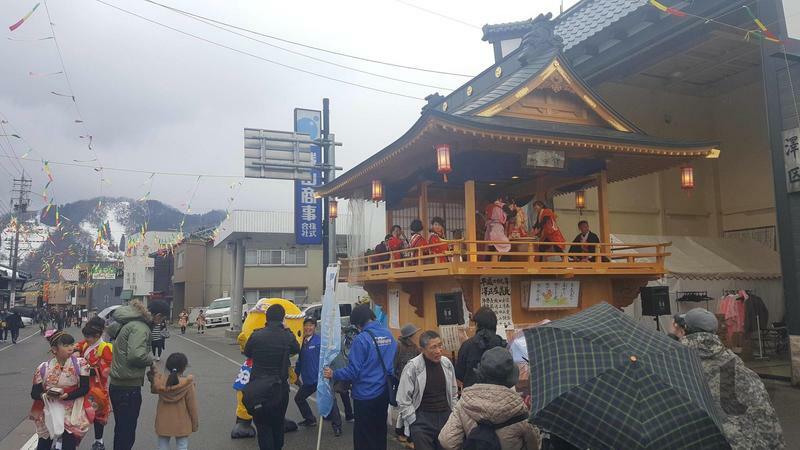 The front doors were wide open and the sake was flowing, so I only tried the best in the house. 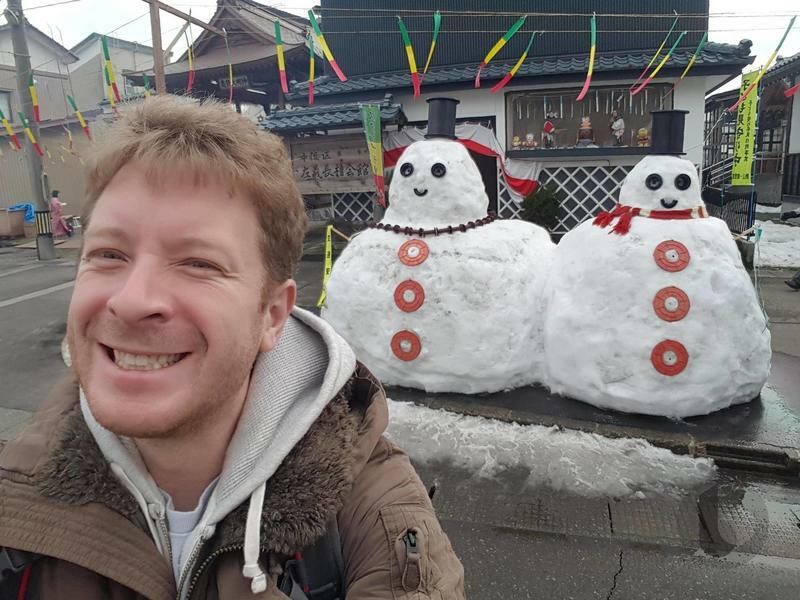 Sadly, I did not stick around for the bonfires that close the ceremony. 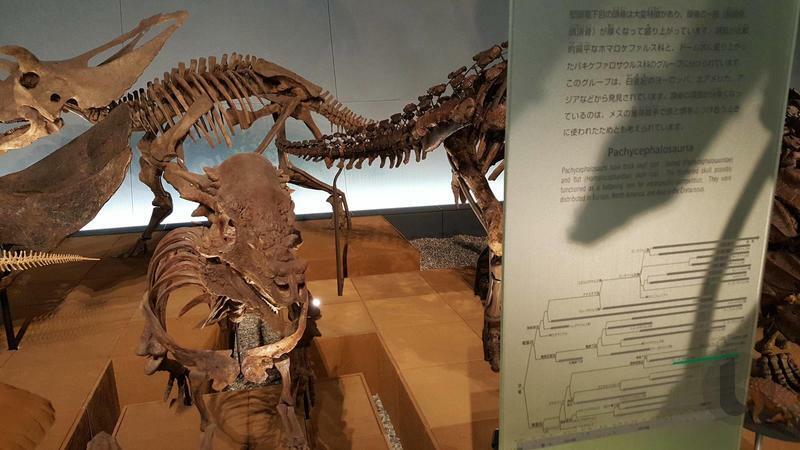 I had to catch a train back to Kobe, and my schedule wouldn’t allow it. 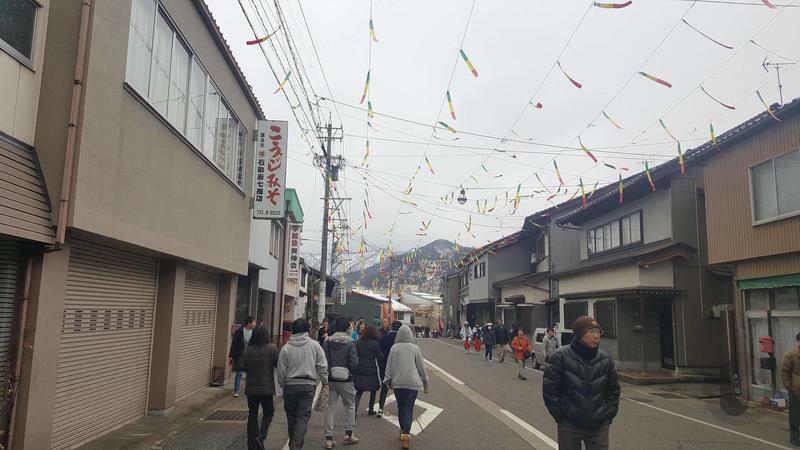 As for the town itself, I liked what I saw. 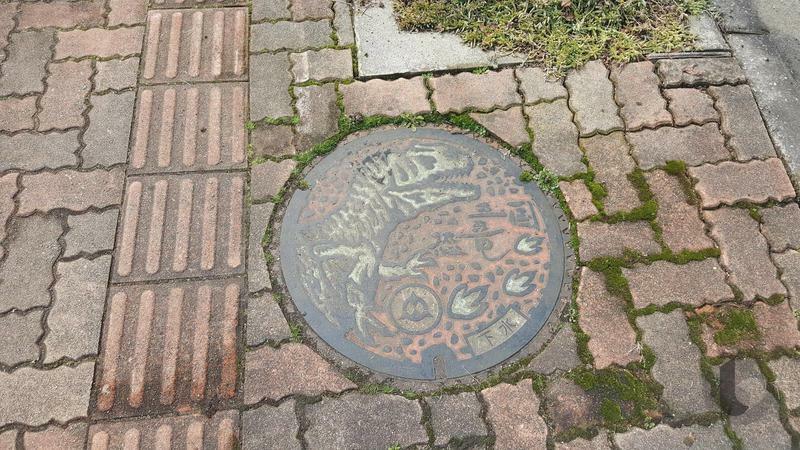 Dinosaurs were everywhere with statues on every block and each manhole cover sporting a different species. 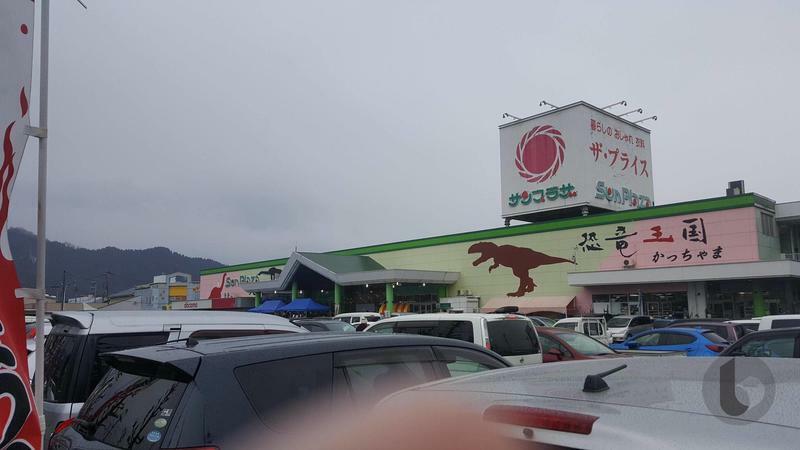 Even the central grocery store had a giant Tyrannosaurus painted on top. 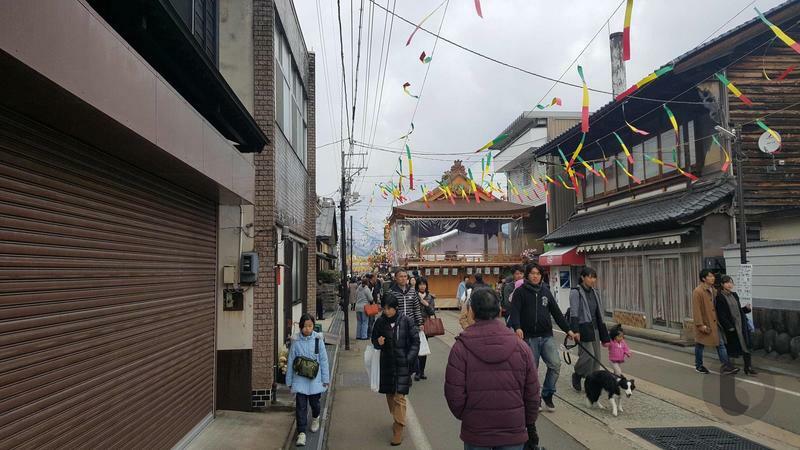 If ever you need to get away from the big cities of Japan, Katsuyama is easily one of those relaxing towns I would love to recommend. 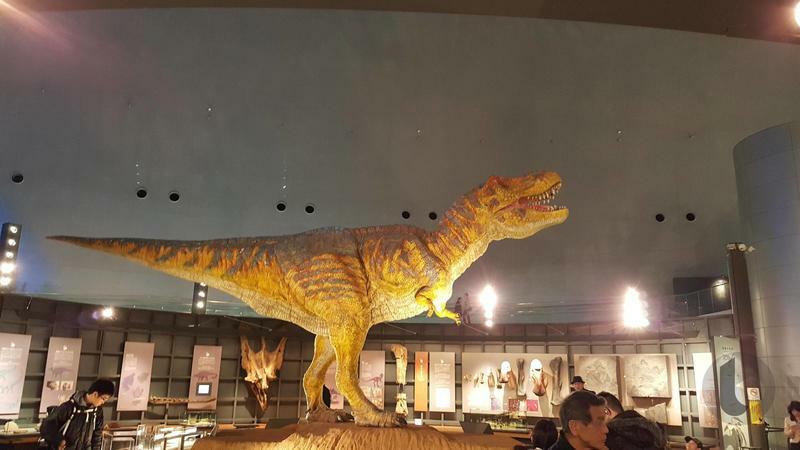 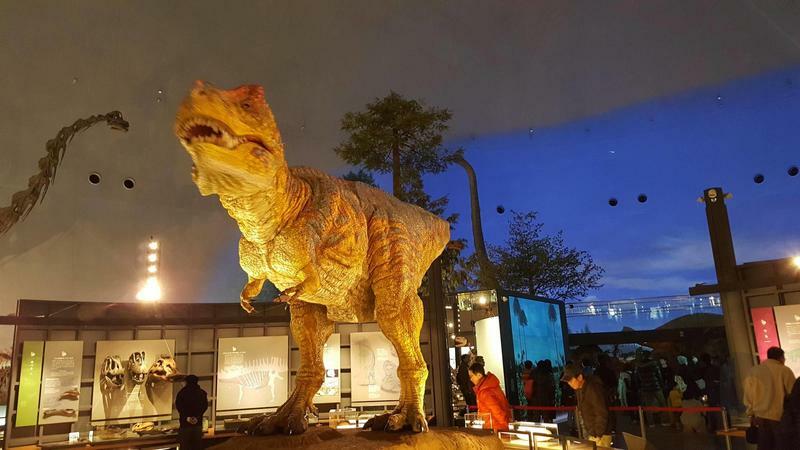 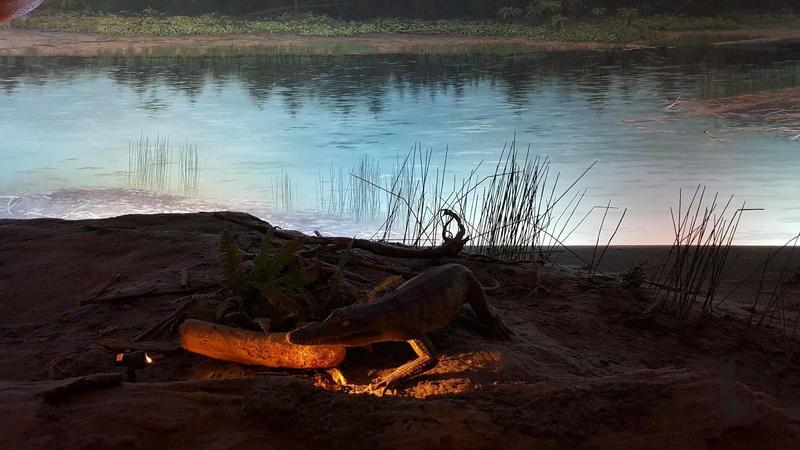 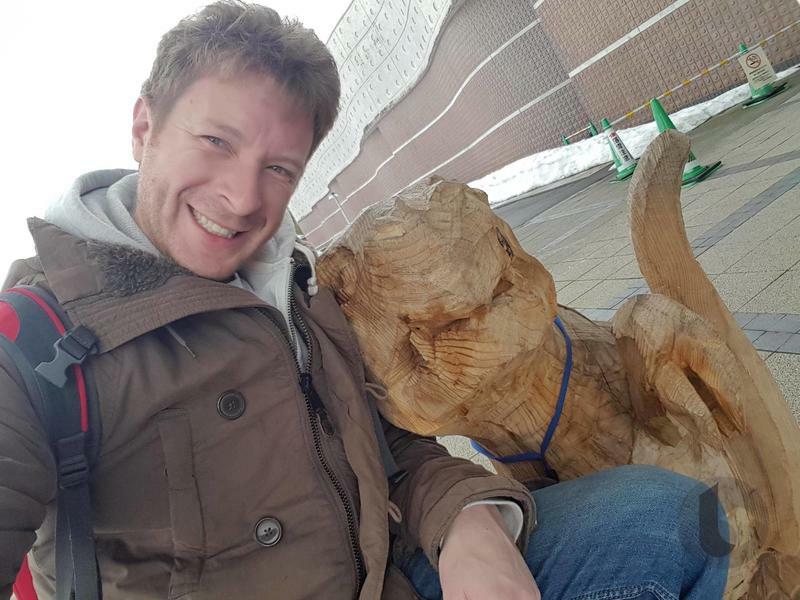 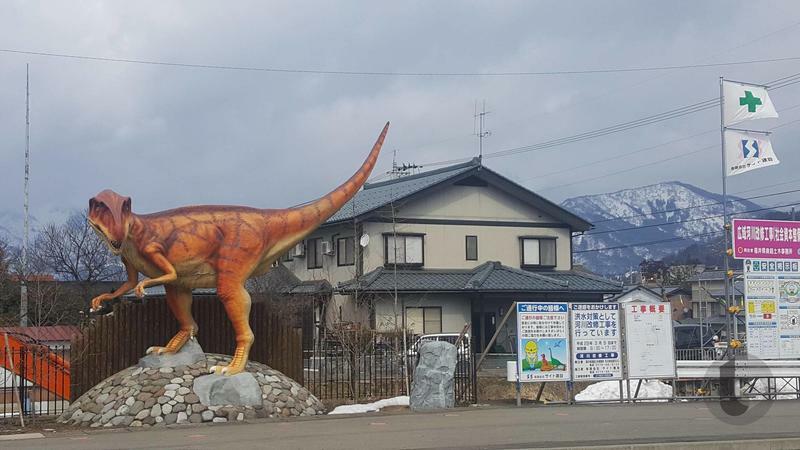 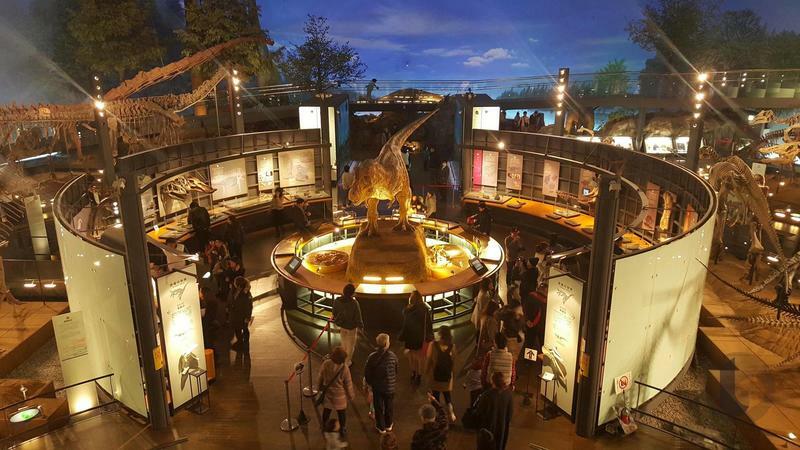 It’s got a friendly community, lots of culture and old buildings, delicious sake, and of course, Japan’s largest dinosaur museum. 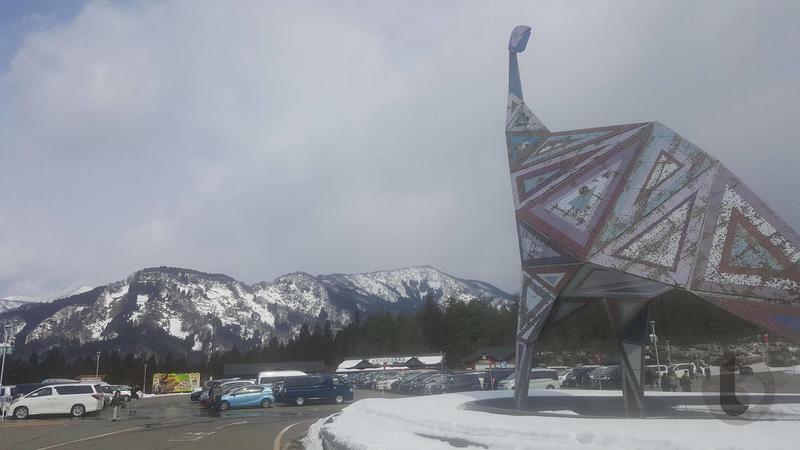 It’s definitely a place I’d like to tour again, and I hope you do as well. 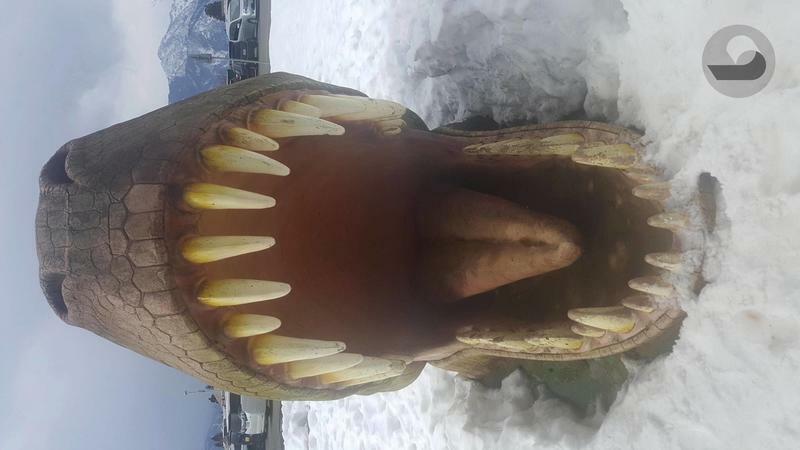 Just, if you take the Thunderbird home, remember to reserve a seat. 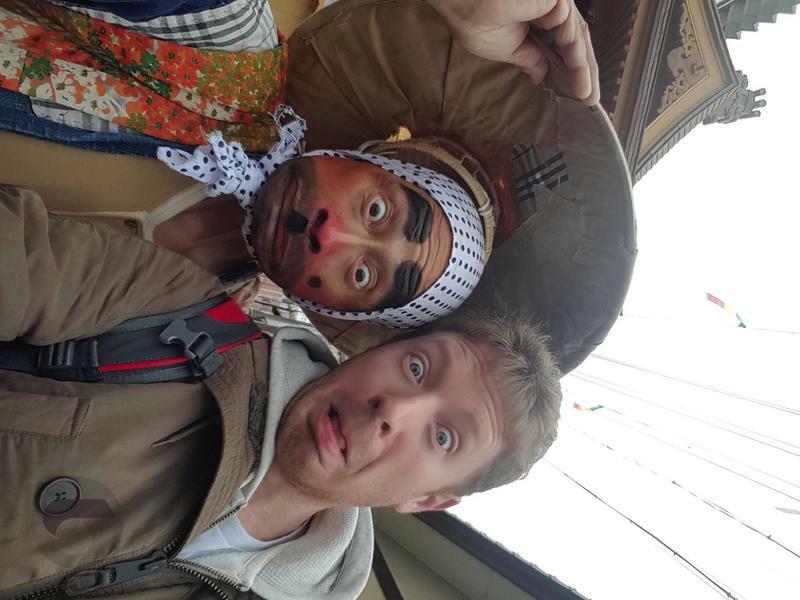 It’s not fun to stand up for three hours on the ride home after an afternoon at a festival. 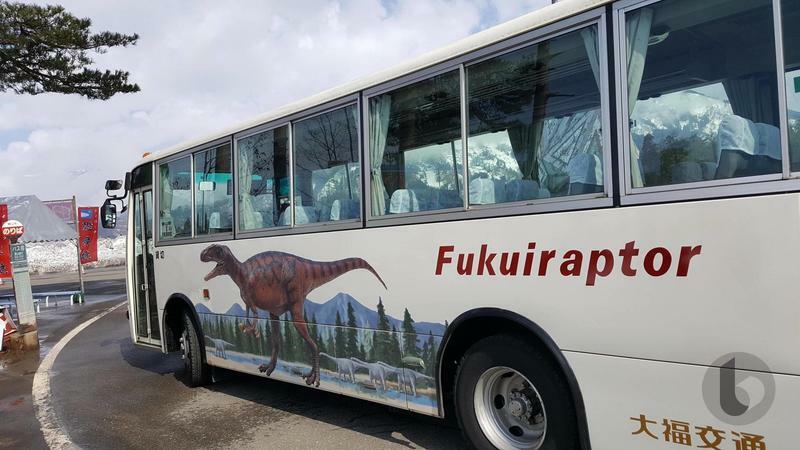 No way will I make that mistake again.